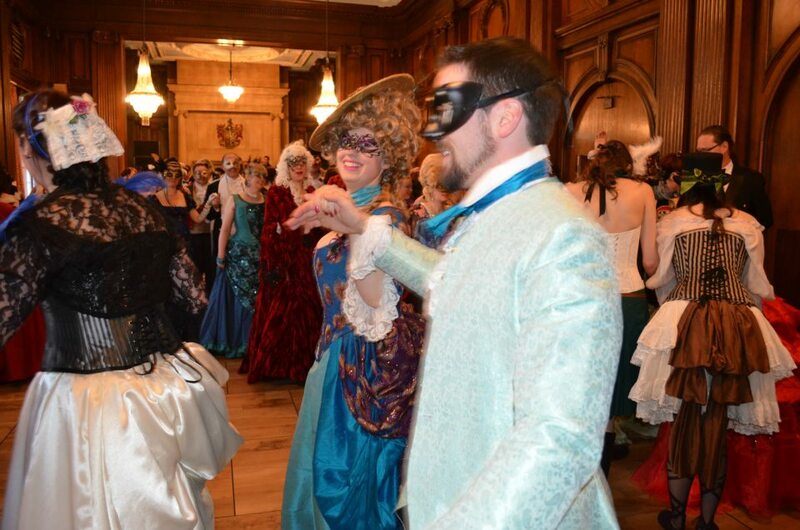 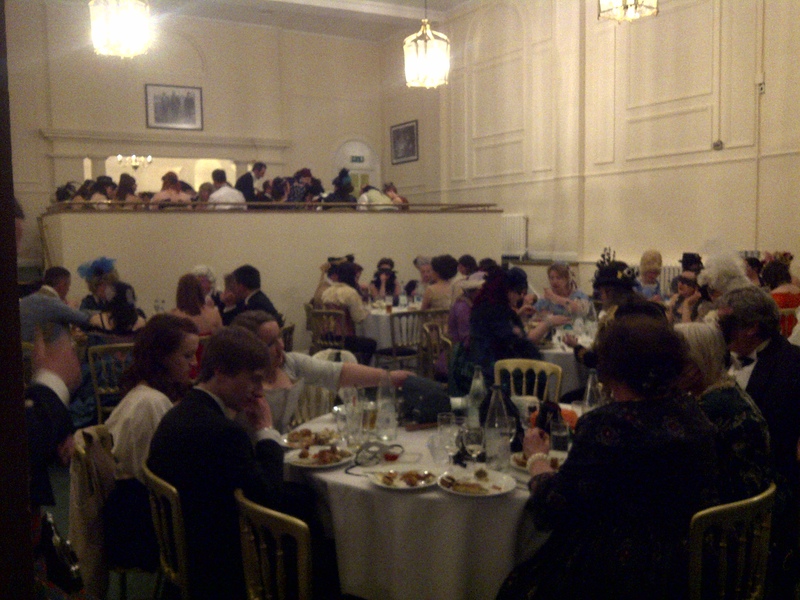 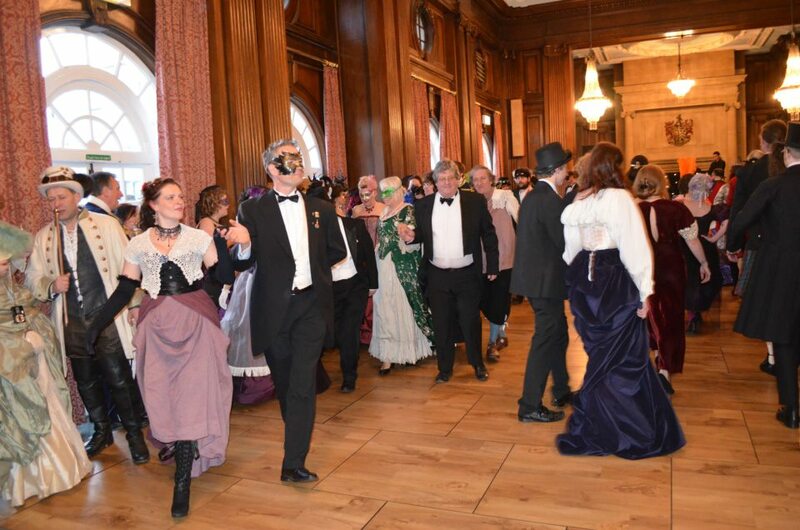 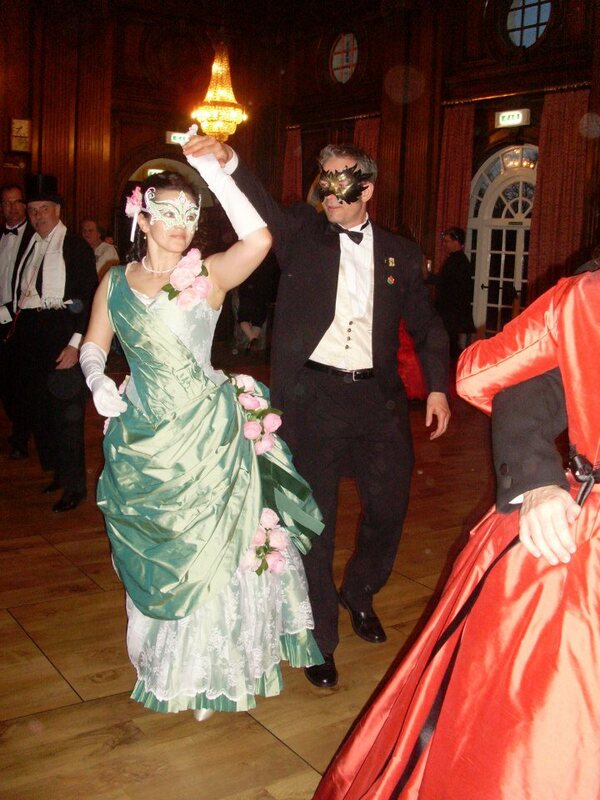 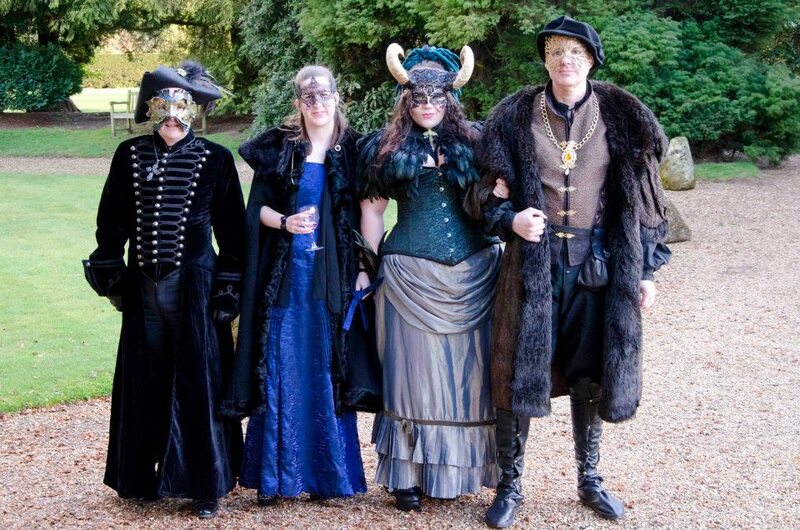 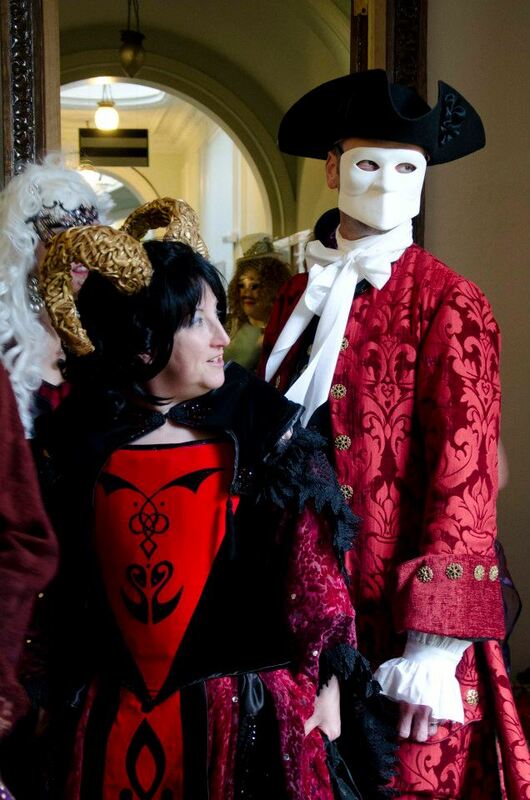 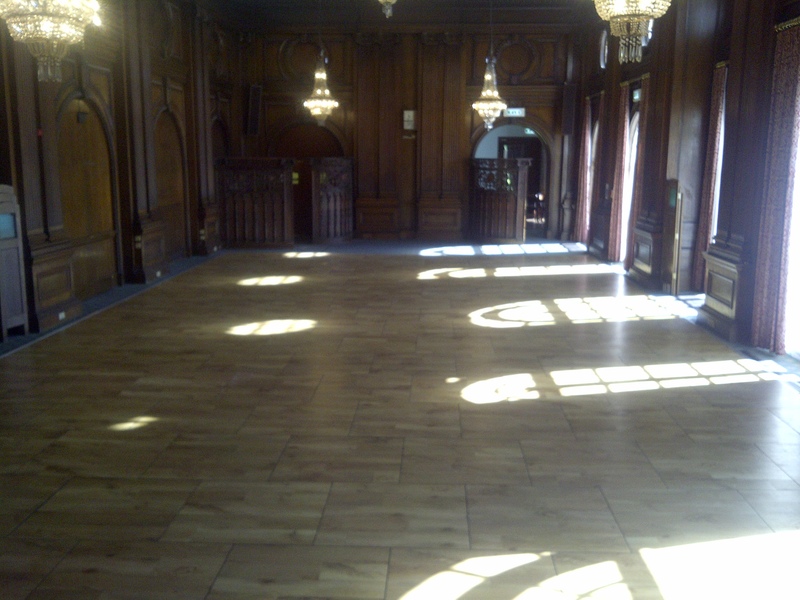 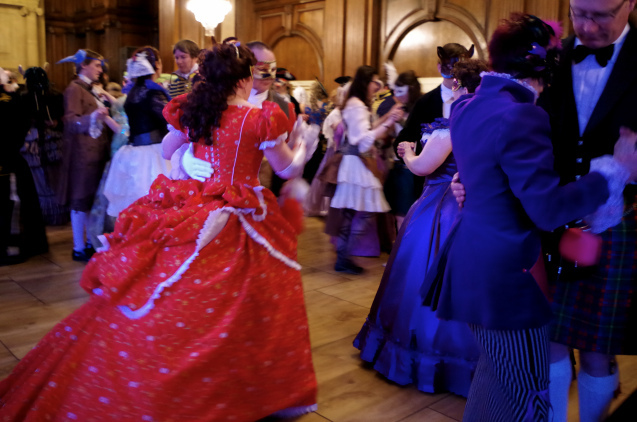 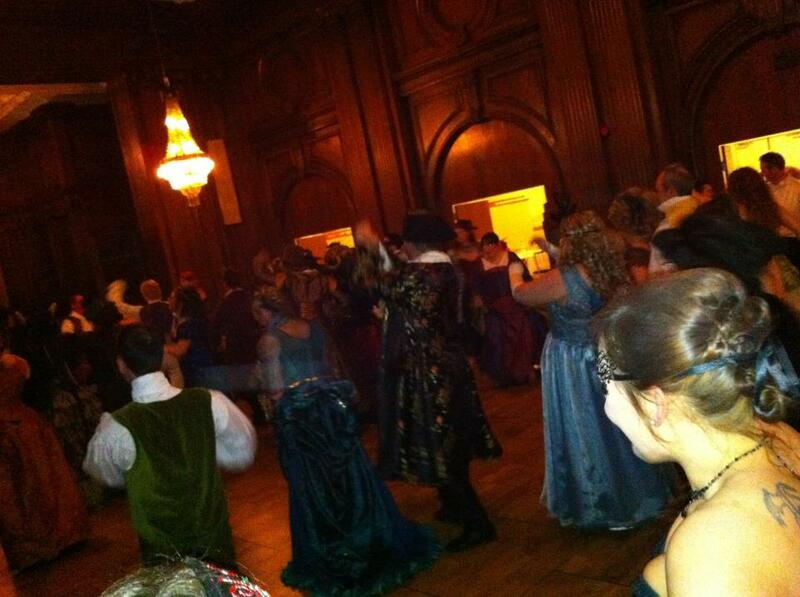 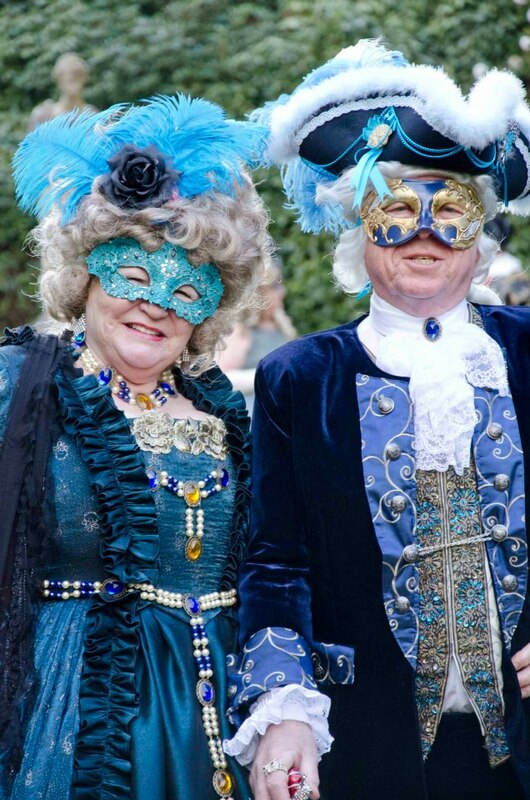 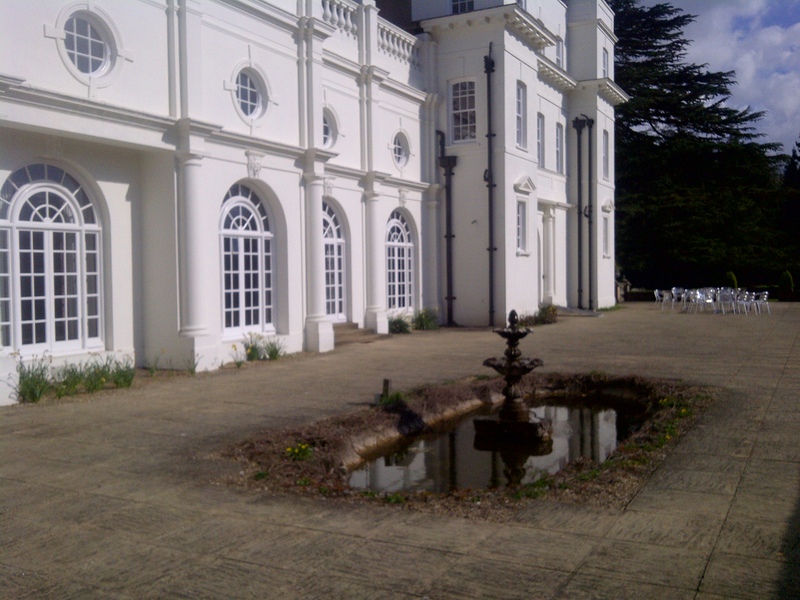 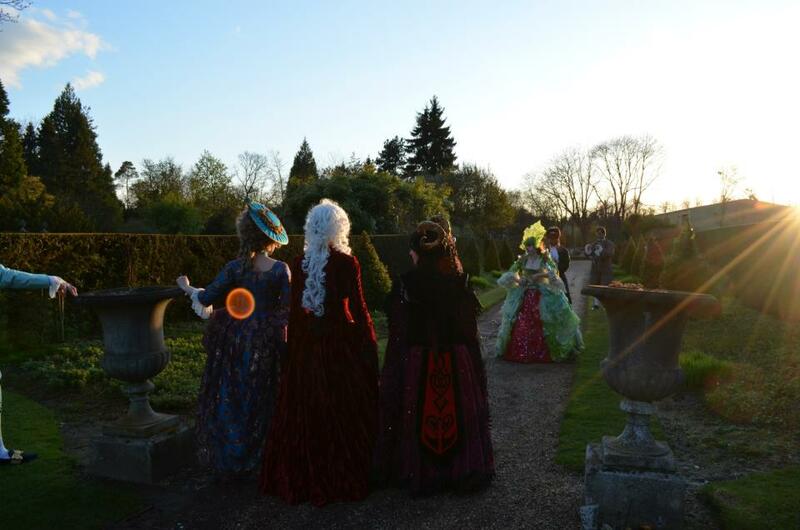 our masquerade ball through the eyes of one of the guests! 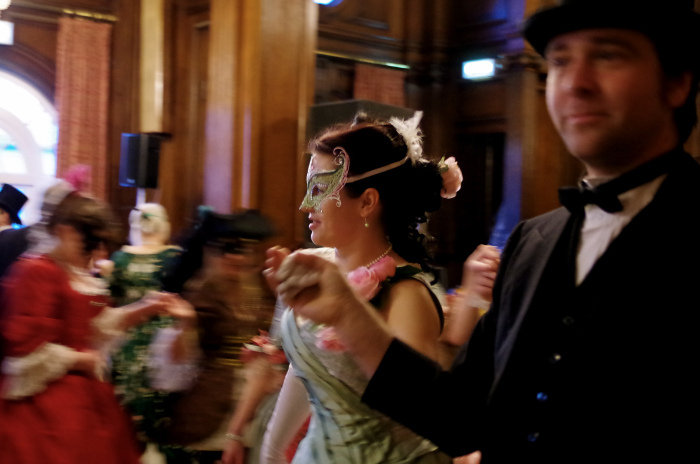 I’ve been meaning to blog about this gorgeous event for a week now, but after an unfortunate formatting disaster, I needed a mourning period to recover from the loss of some rather lovely images. 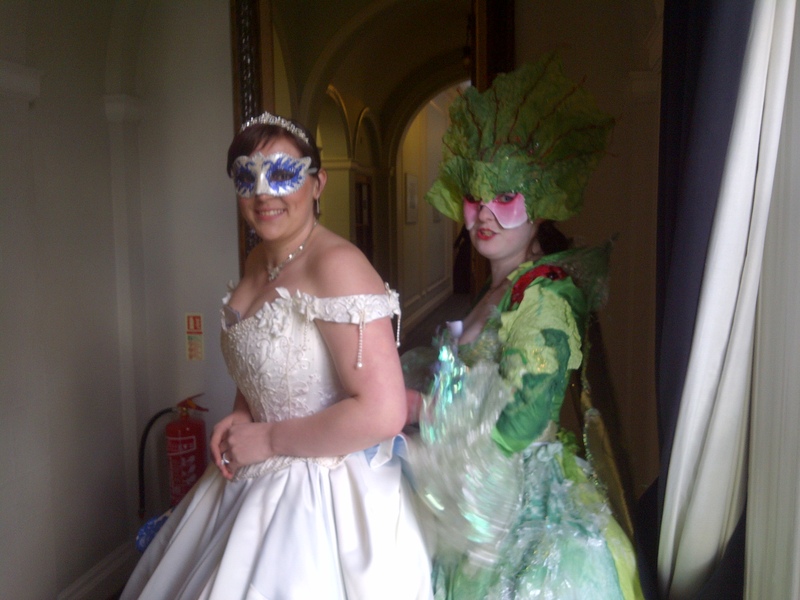 All is not lost however, and I can still share some of this spectacular event, that made me feel like a princess for a day. 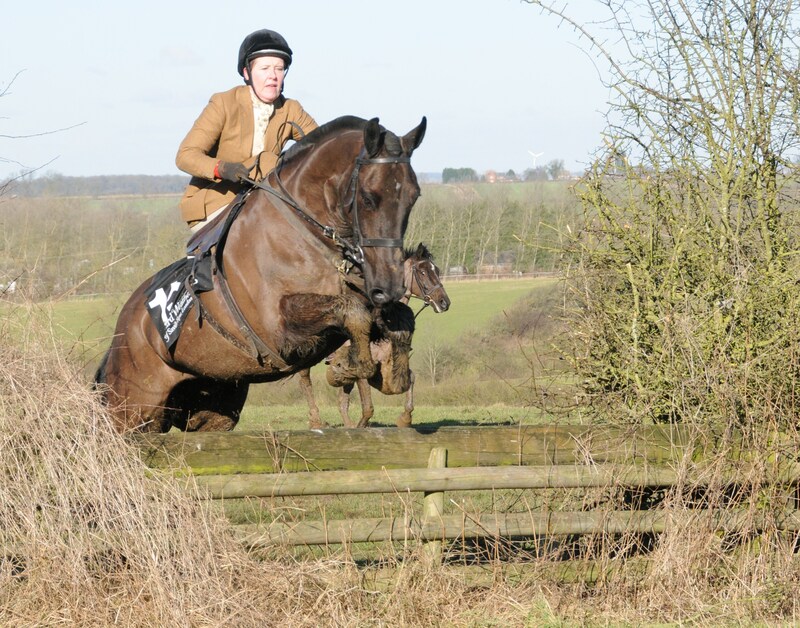 I have been riding since I was 8 – and although I did some show jumping and cross country work in my teenage years, I was always more interested in doing things a bit differently – loved hacking and covering distance – going on long trails was always welcome! 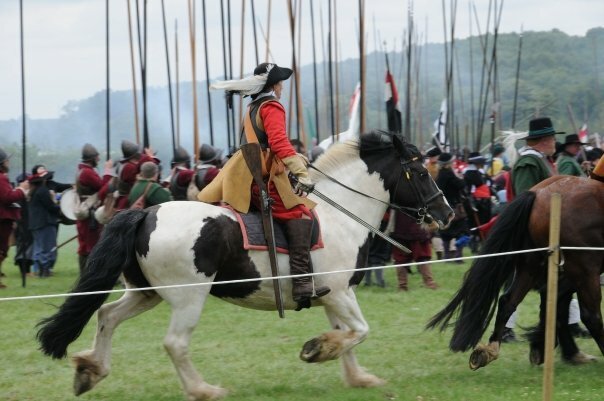 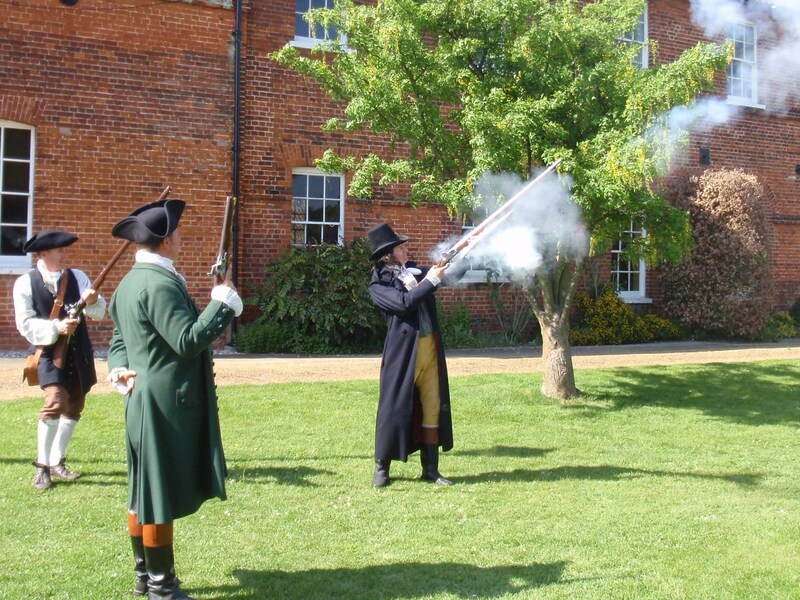 In the Uk, I spent a few years riding for a cavalry regiment for the English Civil War Society – swashing my sword and firing carabines from horseback was by far much more interesting! 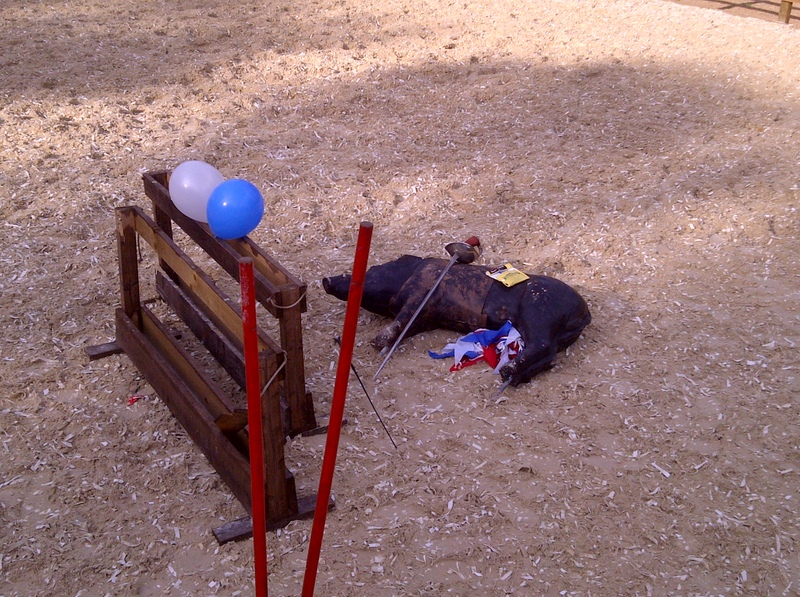 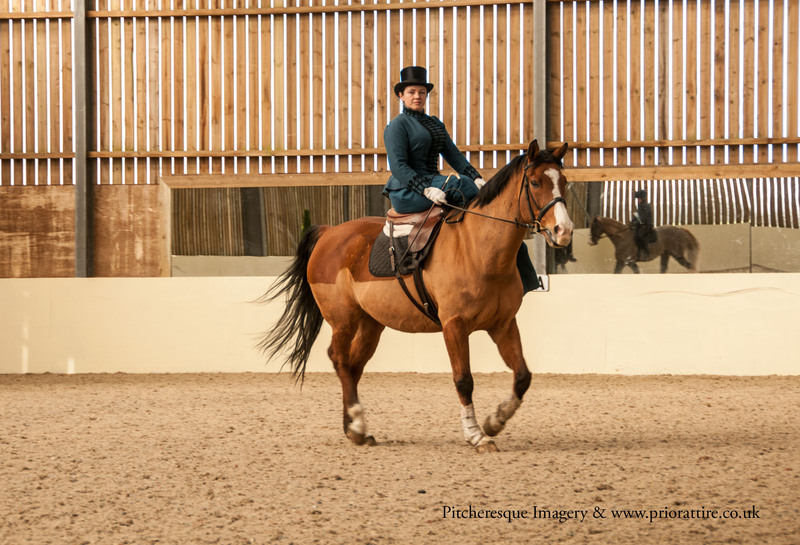 I have tried some horseback archery and Roman riding with a group Comitatus – great fun! 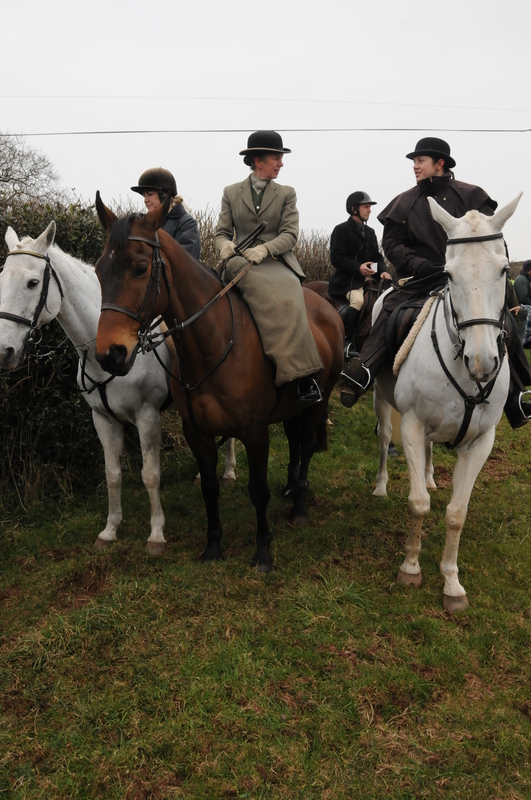 Nowadays I mostly hunt in Devon and Somerset, riding lovely thoroughbred horses blessed with amazing stamina – going up and down those hills there for 6-7 hours sometimes is by no means a mean feat! 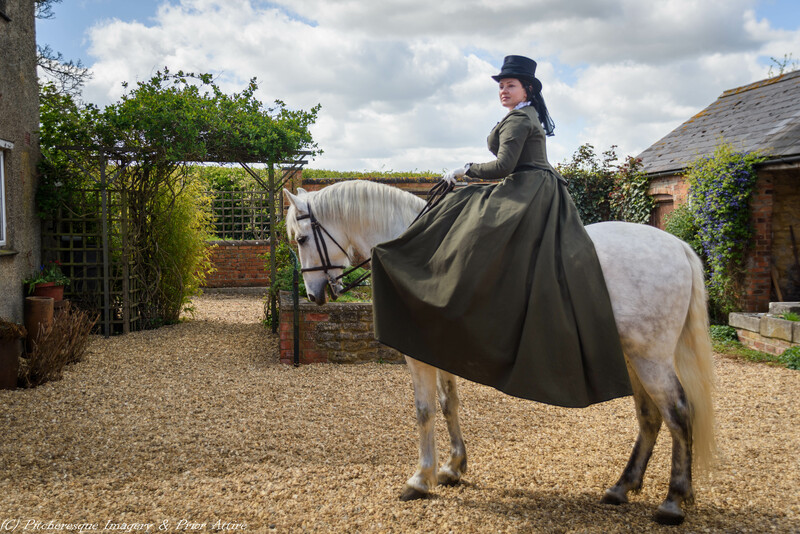 But I have always wanted to give a side saddle a go – to canter through the fields as a real lady would, all style and elegance. 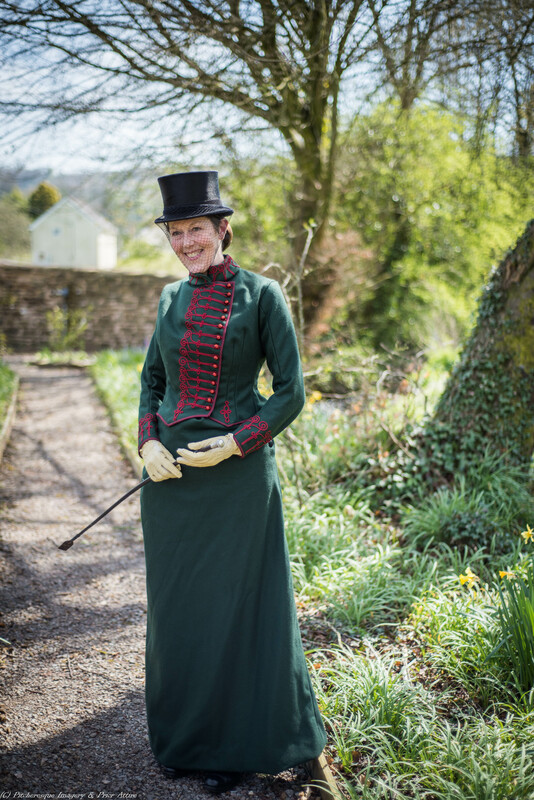 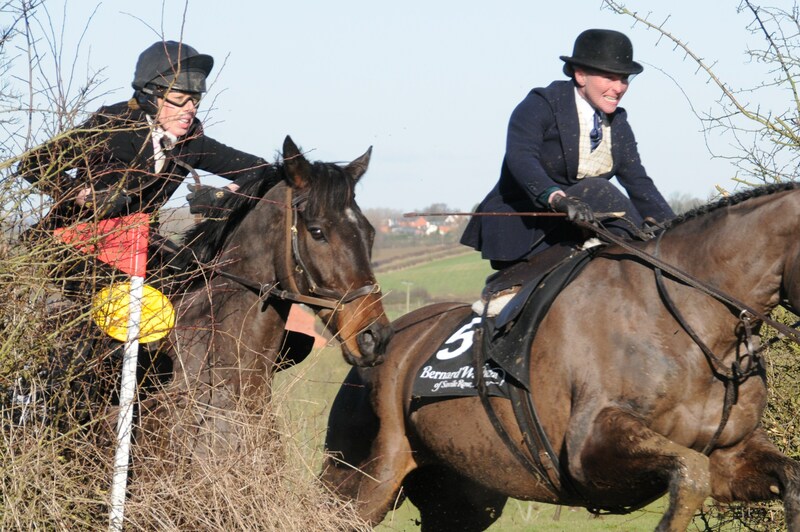 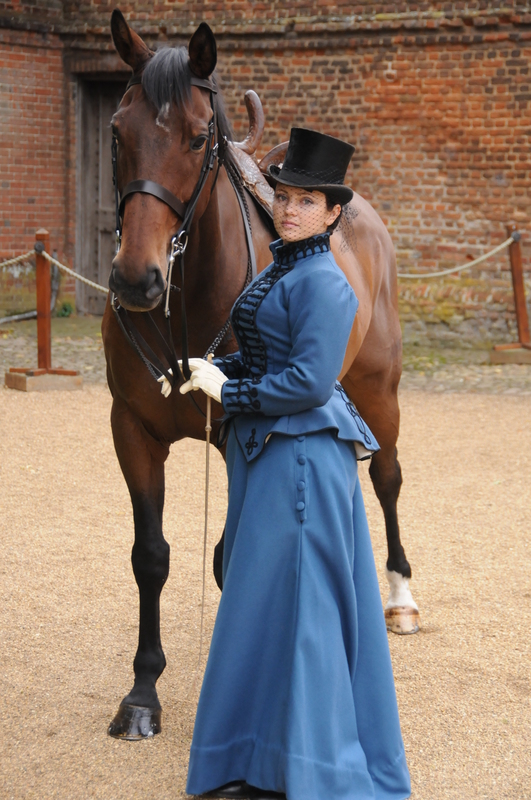 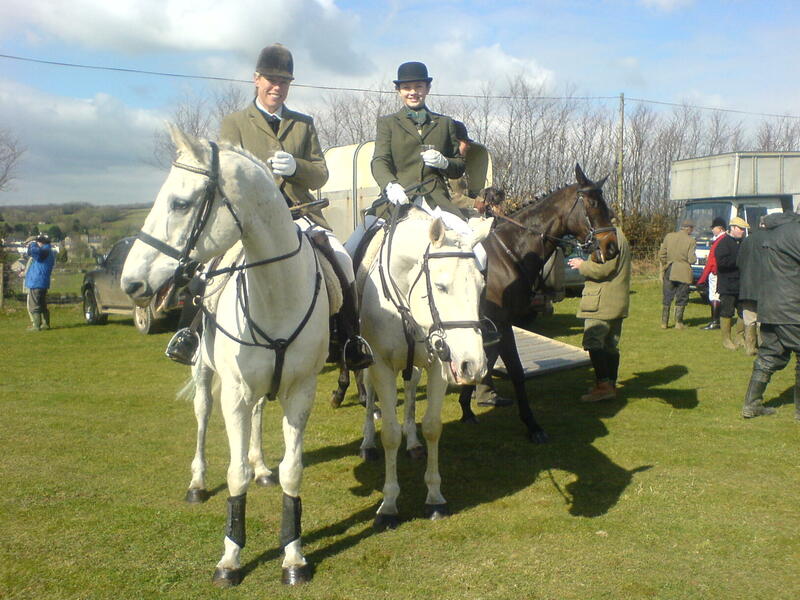 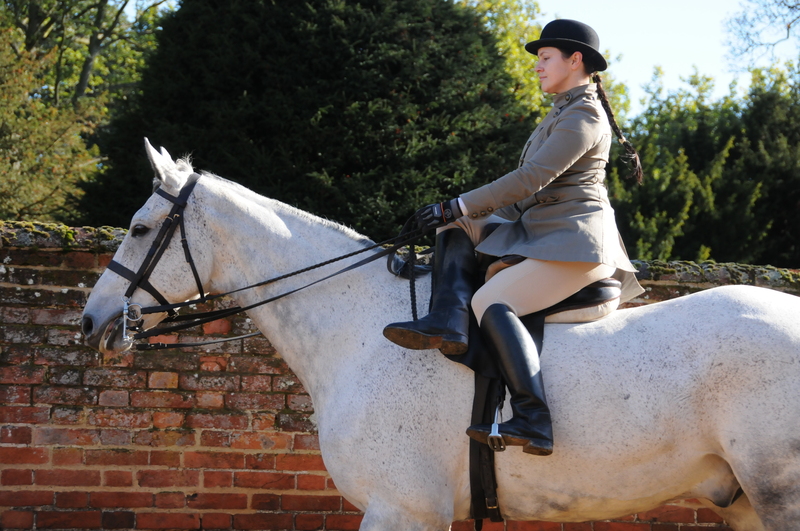 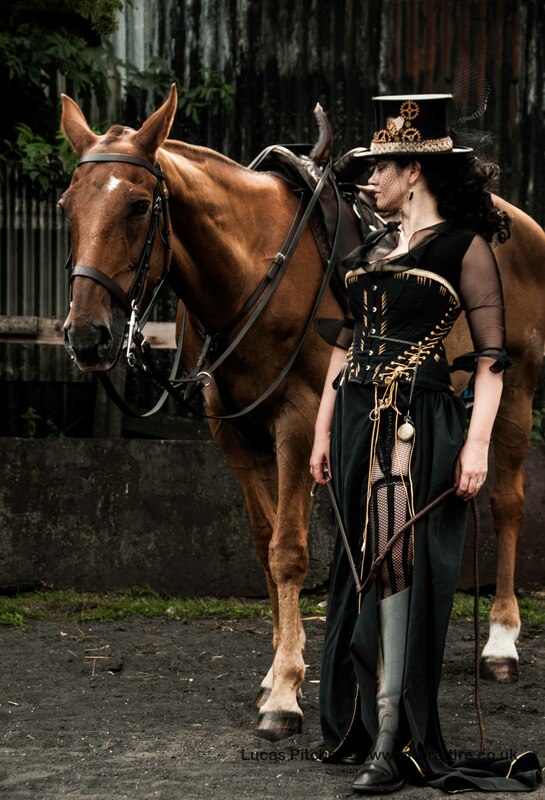 Well, in the recent years SS seems to have been enjoying a come back – and so an opportunity arose one winter, a few years ago, when I was introduced to Michelle who hunts sidesaddle on Exmoor. 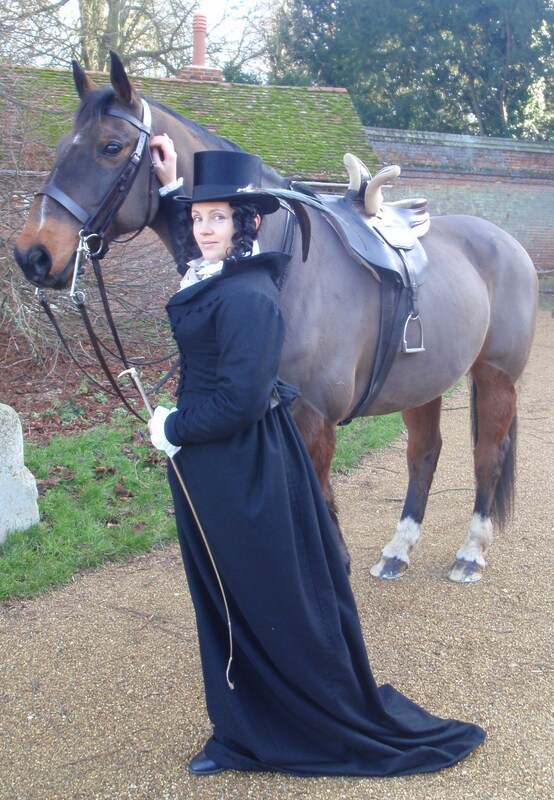 Michelle on her Joseph, all elegance – and me on Zeberdee, warmly wrapped up agains one of the coldest winds ever – more of a wild west hussy than a lady…! 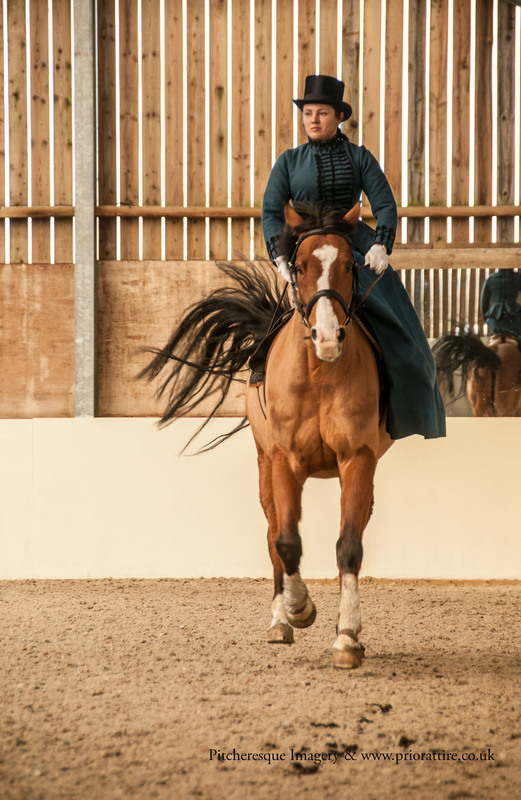 The first lesson went well, and I rode a few times under Michelle’s tutelage – but alas, it turned out to be pure torture! 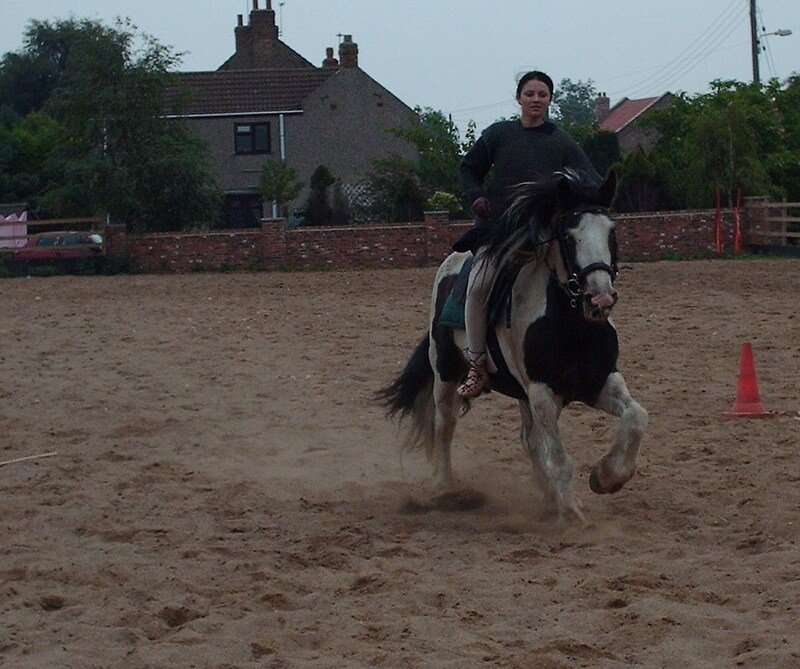 my right knee was in agony after about 20 minutes. 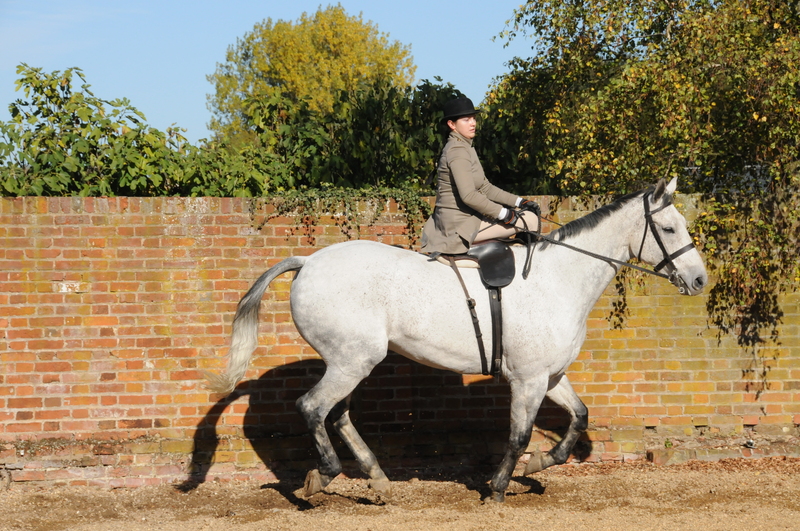 and so I thought that my wonky knees were not really designed for side saddle. 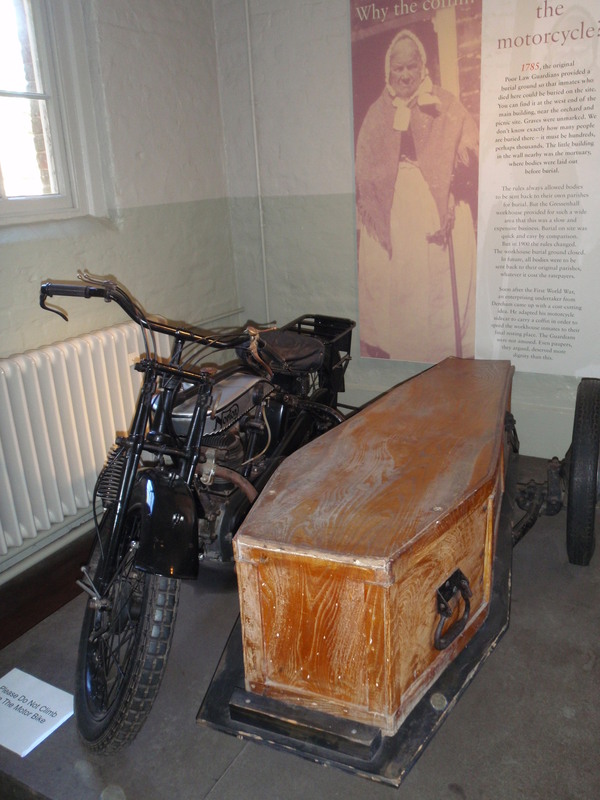 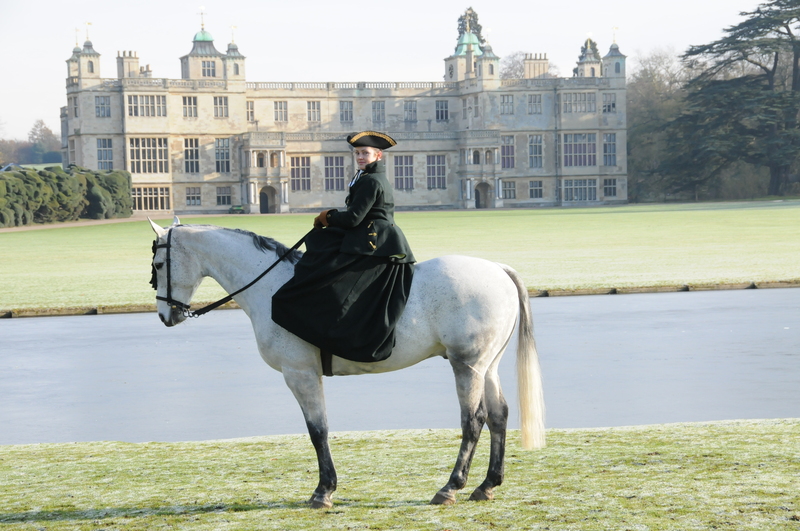 I didnt know much about it then and it wasnt till I met Becca Holland, currely working at Audley End House, who suggested that maybe the saddle was just too short for me. 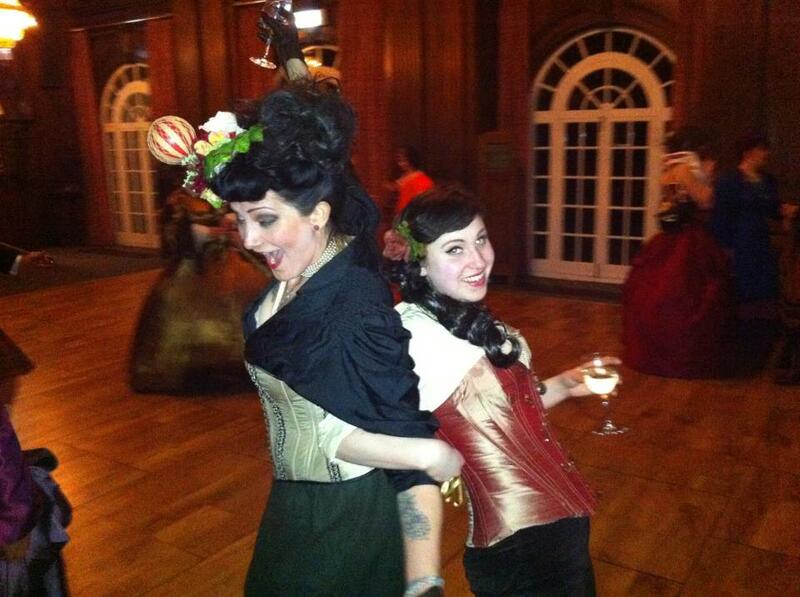 Michelle is petite – me – not so much! 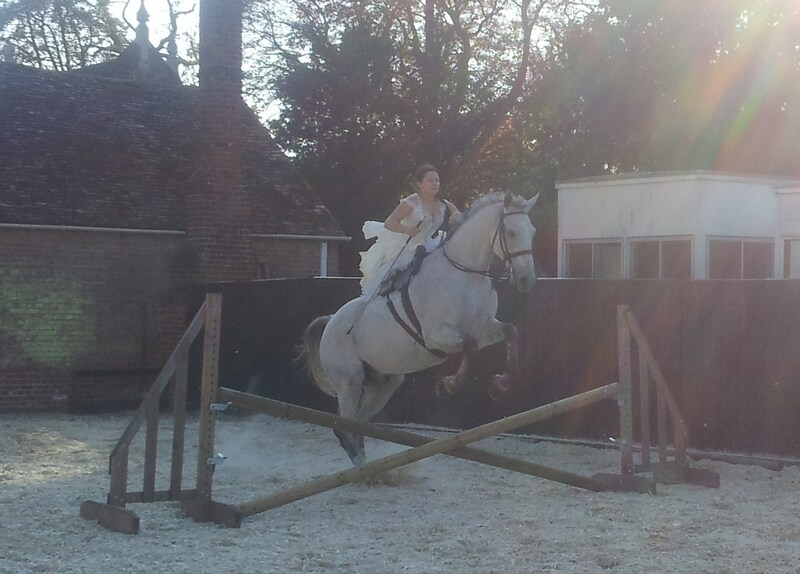 Spirits were raised and i was determined to give it another go. 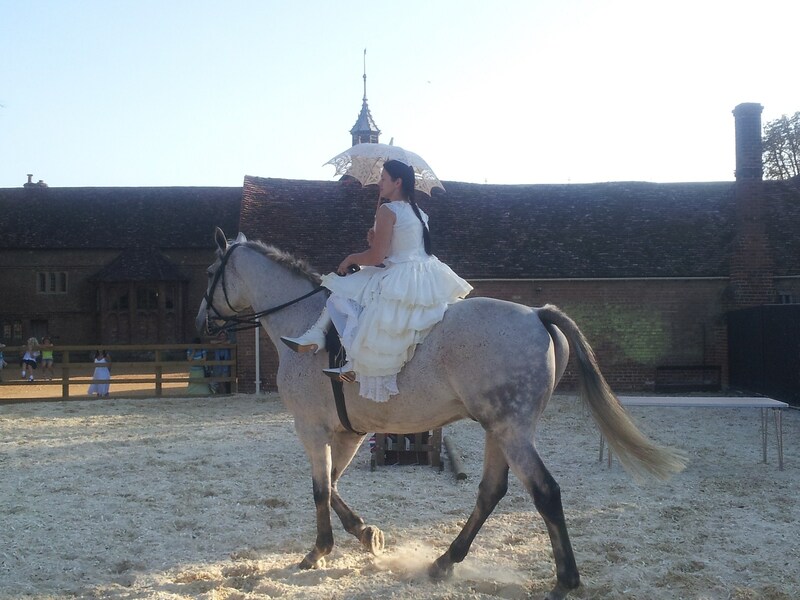 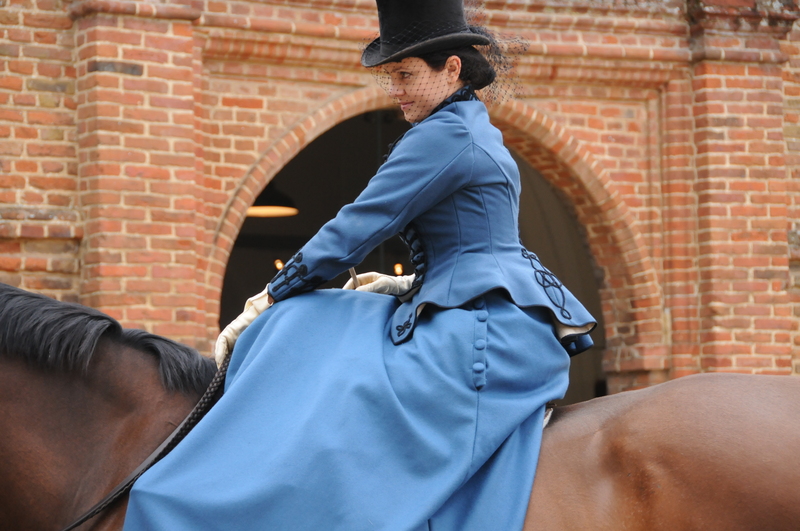 As i just got engaged at that time, i wanted to ride side saddle after the ceremony – so I also had another excuse to learn the skill! 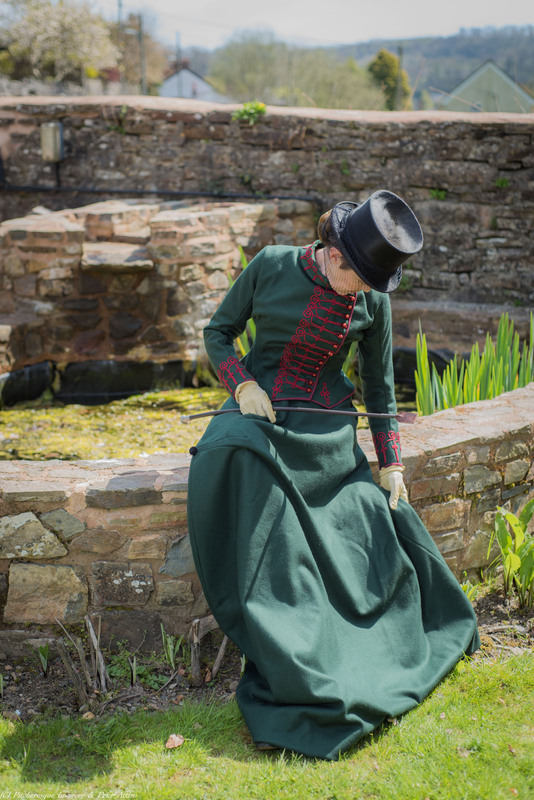 I also discovered that turning to your left can end up badly – my first fall was even captured on the camera ( almost, before hubby turned it off and rushed to rescue – unnecessarily asmy bowler hat was made of sturdy stuff an survived the impact… )video here . 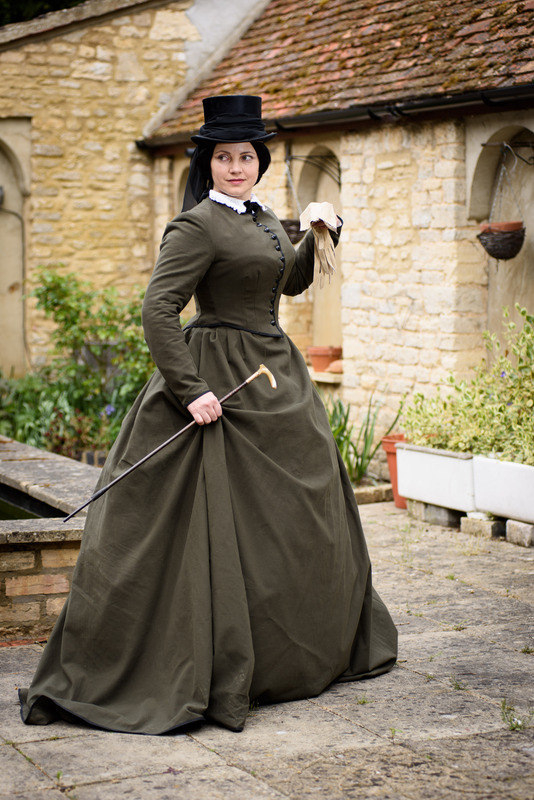 After that lesson weather worsened and all I was able to do is to plod around on the frozen grounds, modeling my growing collection of habits. 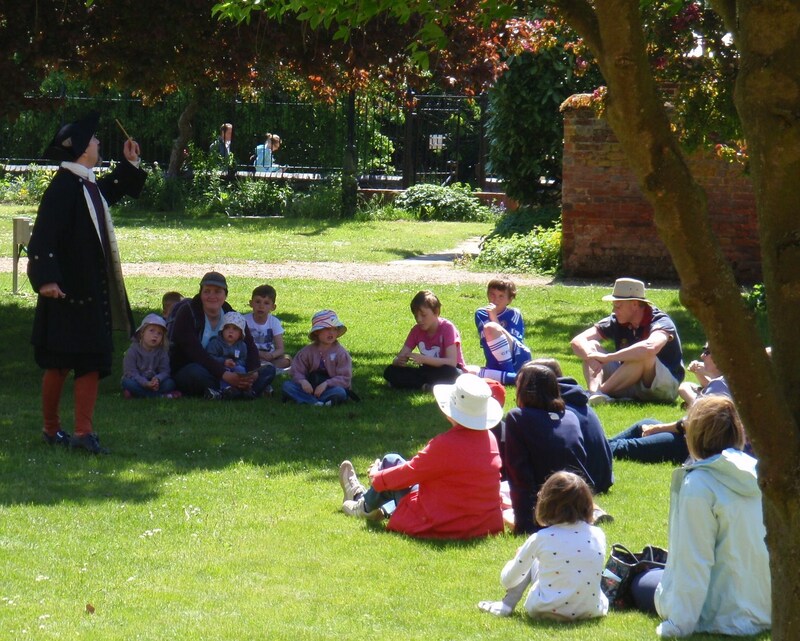 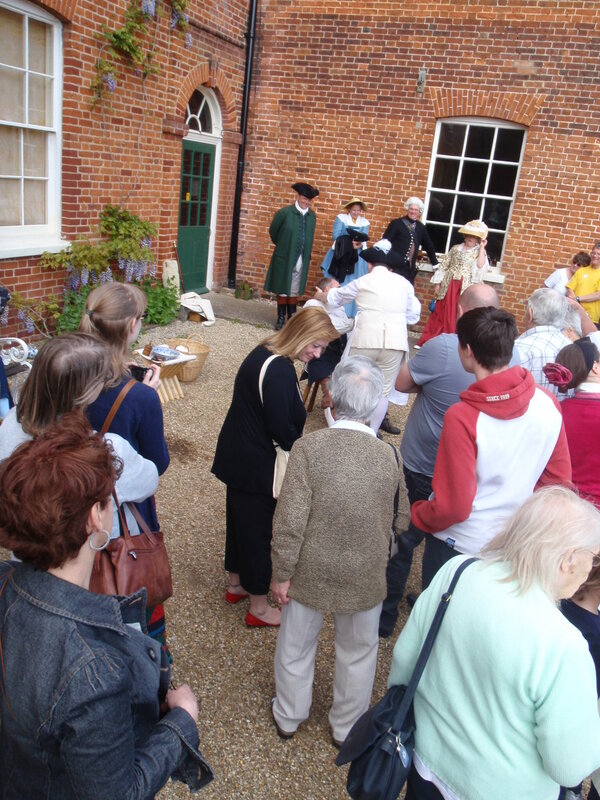 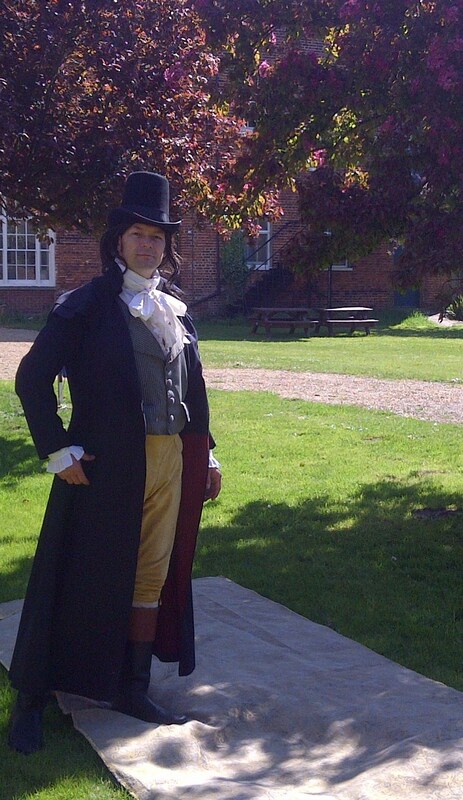 Here at a show and tell event, sporting a 1785 riding habit in wool – double wool vest , wool skirt and jackets meant I was not frozen! 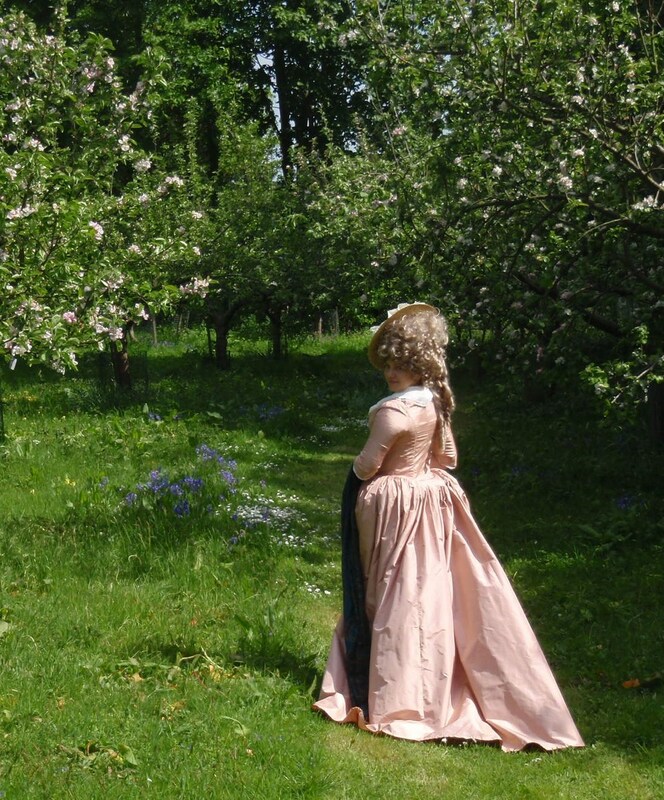 But then the spring came and we started training more – and after a few more lessons, and no more falls, I was allowed to go outside and play in a bigger field. 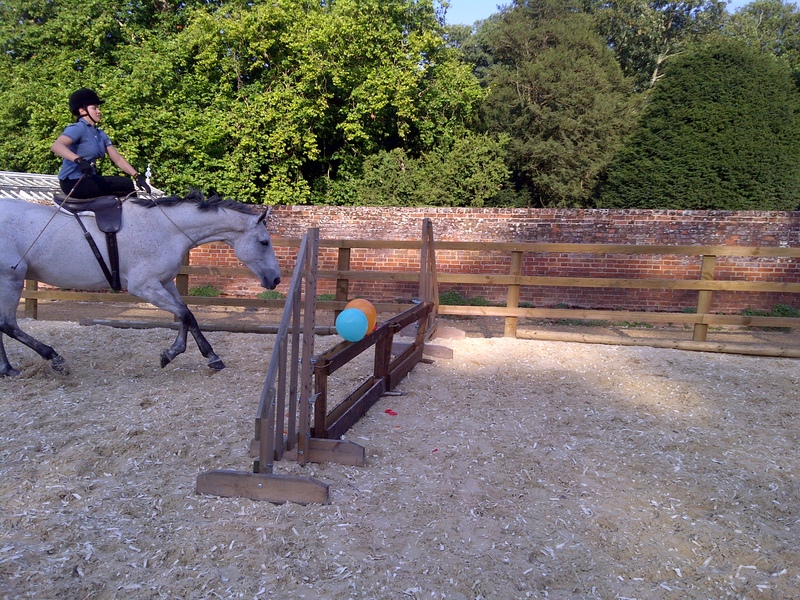 As my jumping progressed, we started to add toys – at one lesson i did a lot of jumping and throwing speers at boars – at another i was piercing balloons with a sabre – endless fun! 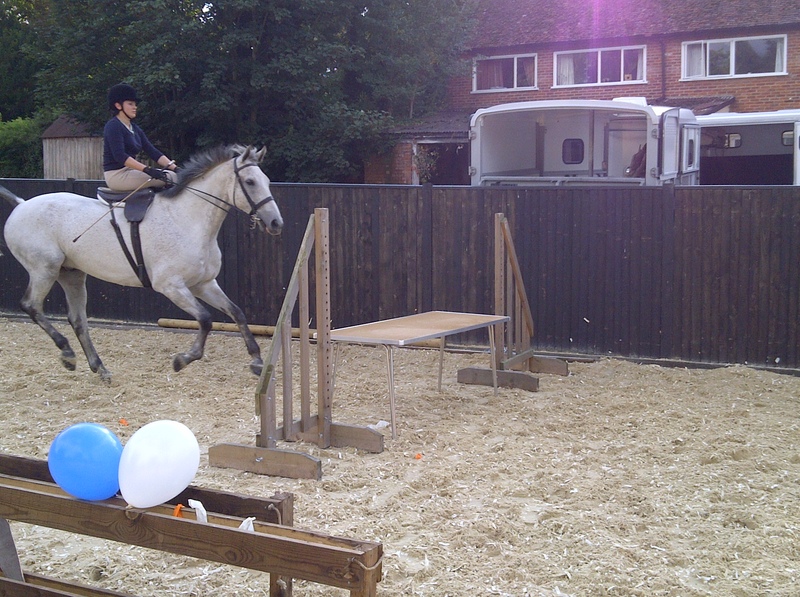 In the end, i was able to do Becca’s favourite trick – jumping over a table and snatchign a glass of champagne while flying over – here is my practice run! 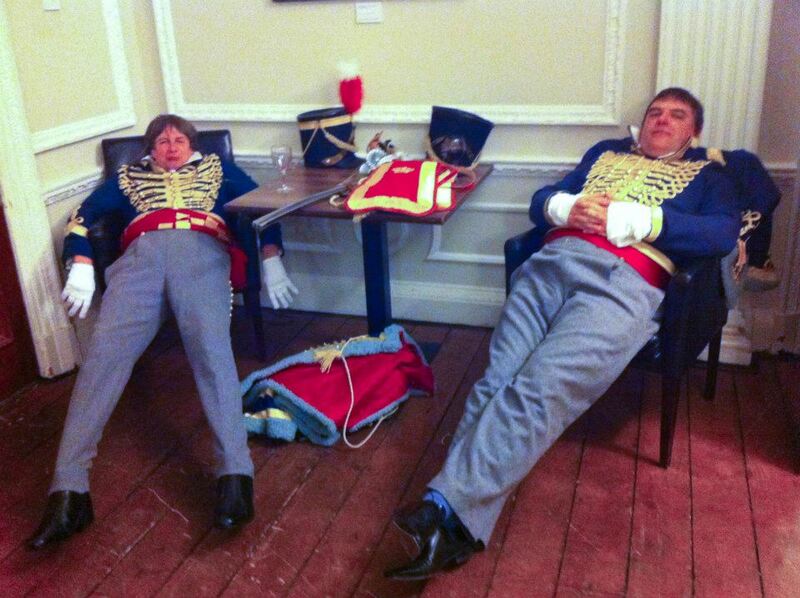 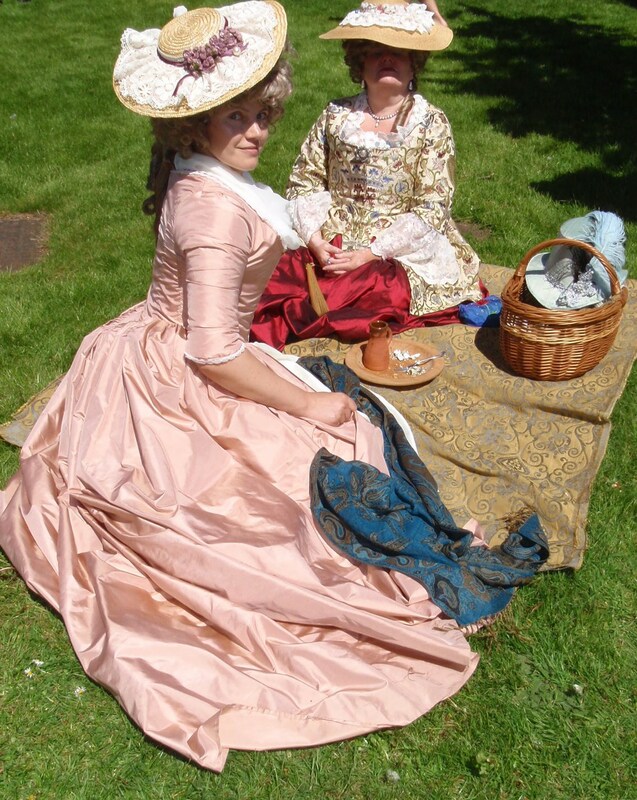 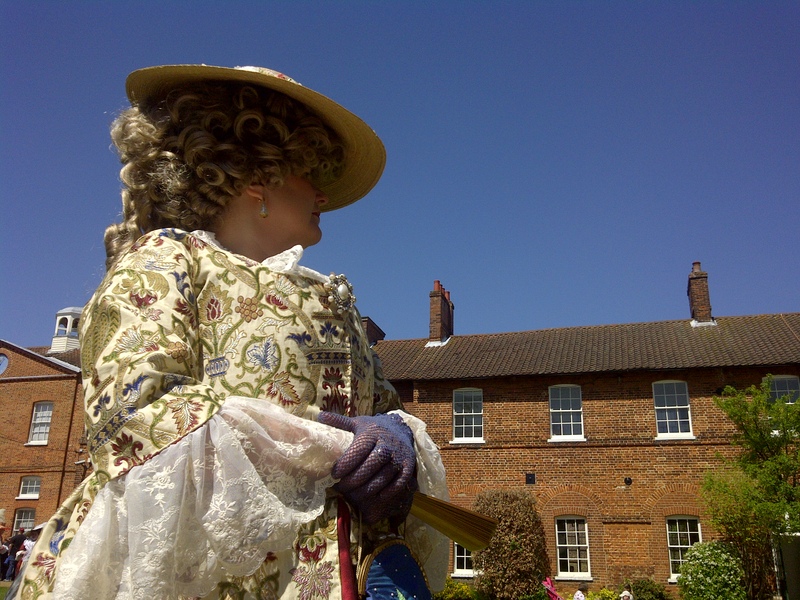 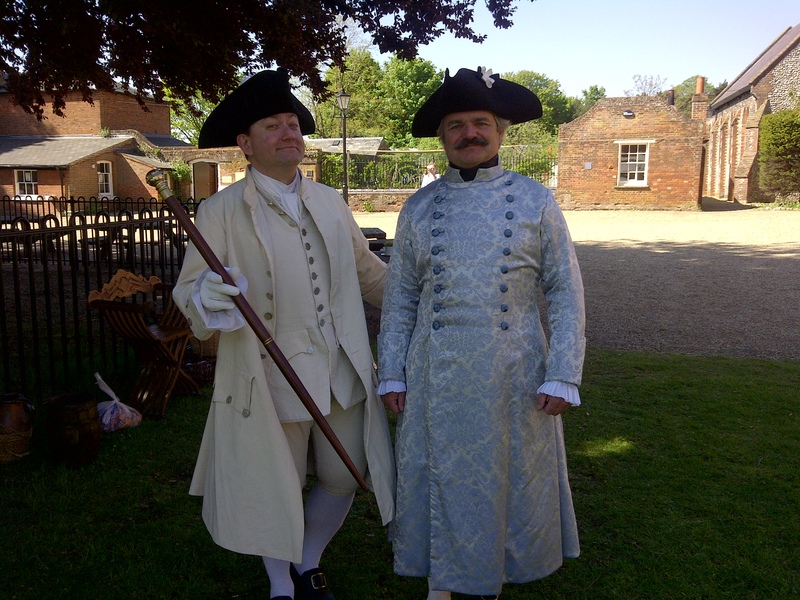 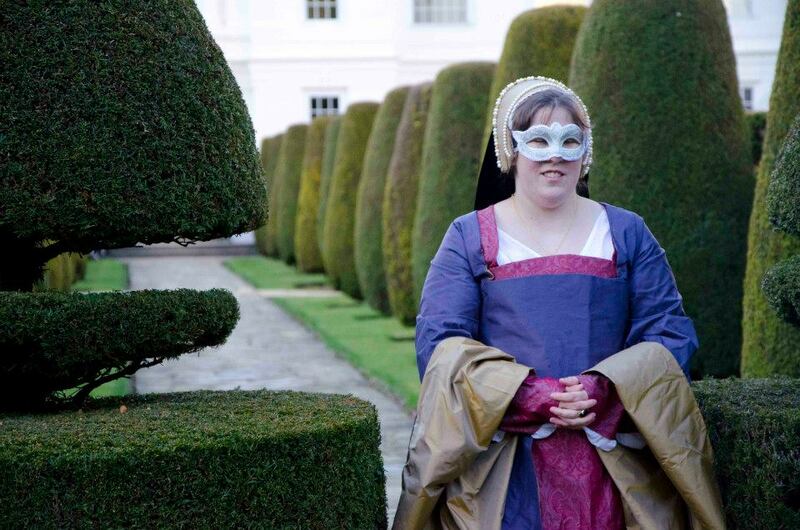 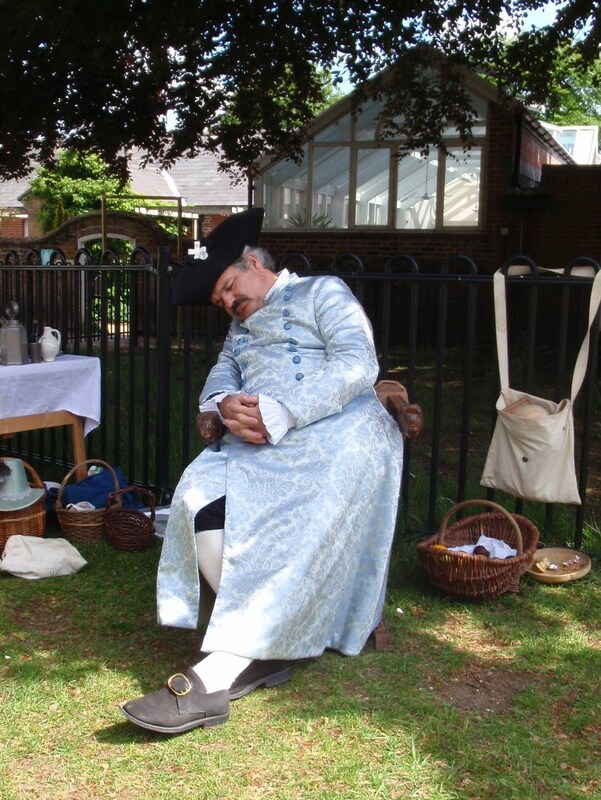 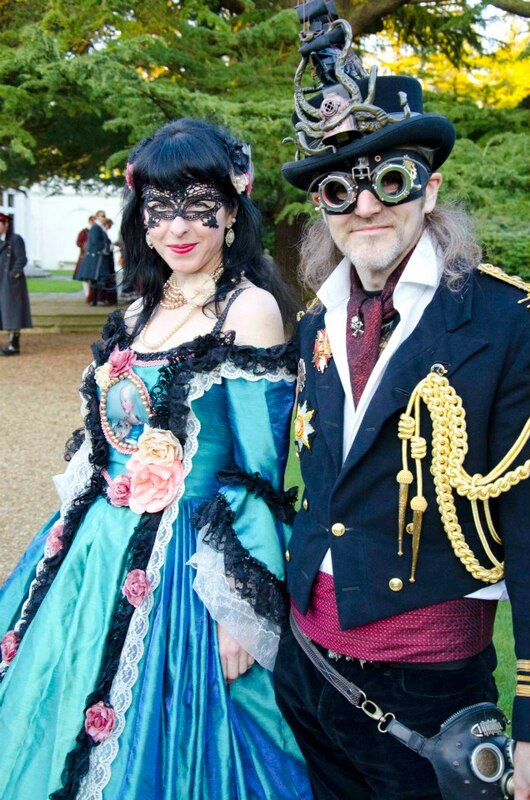 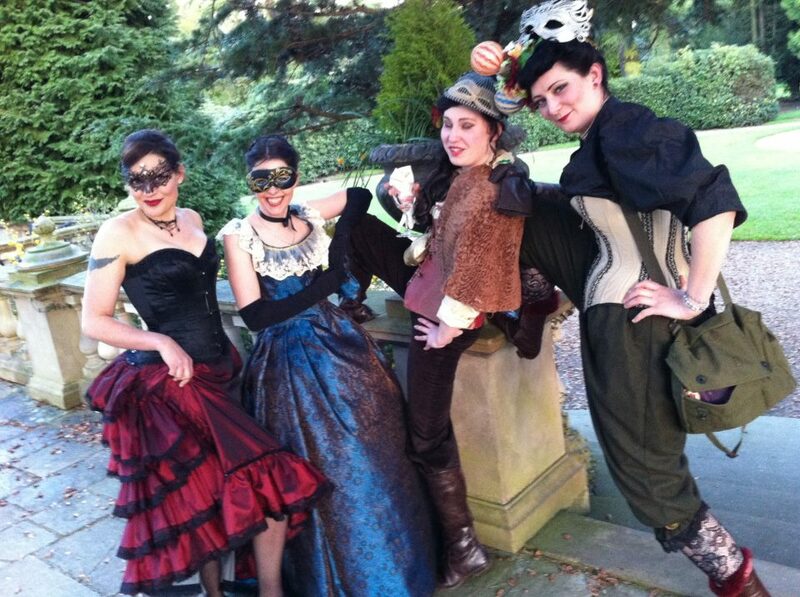 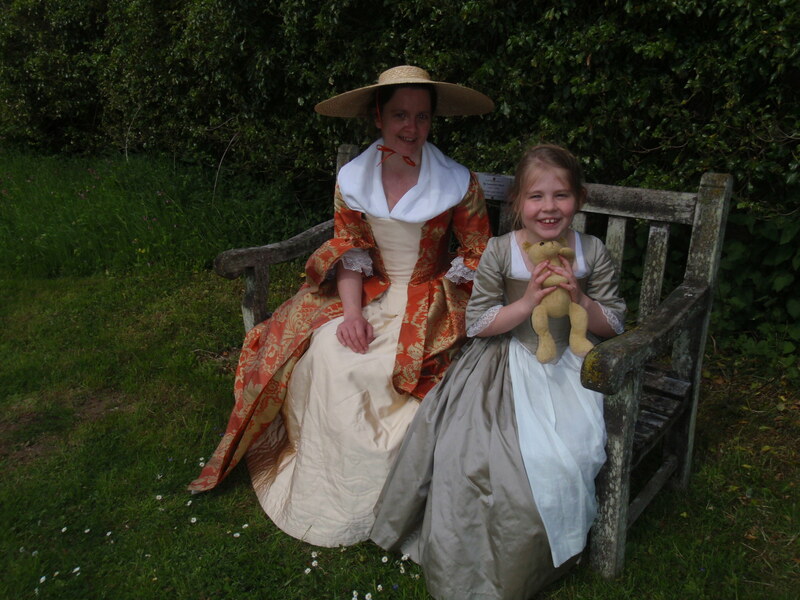 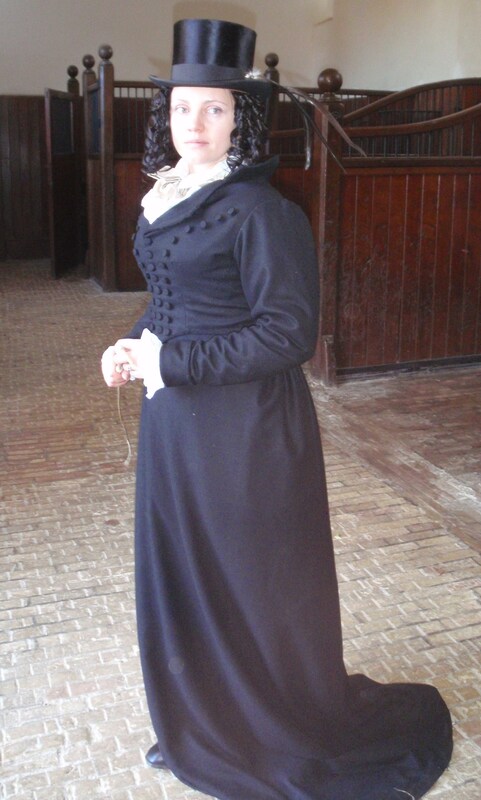 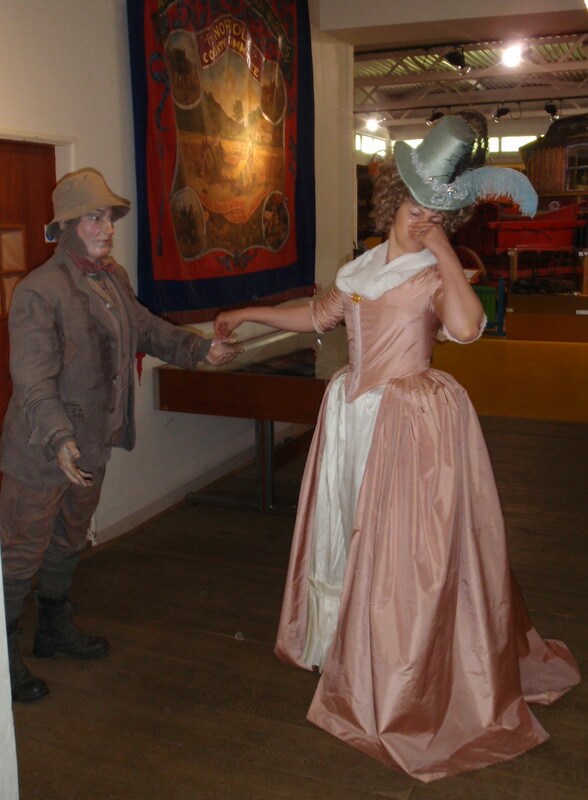 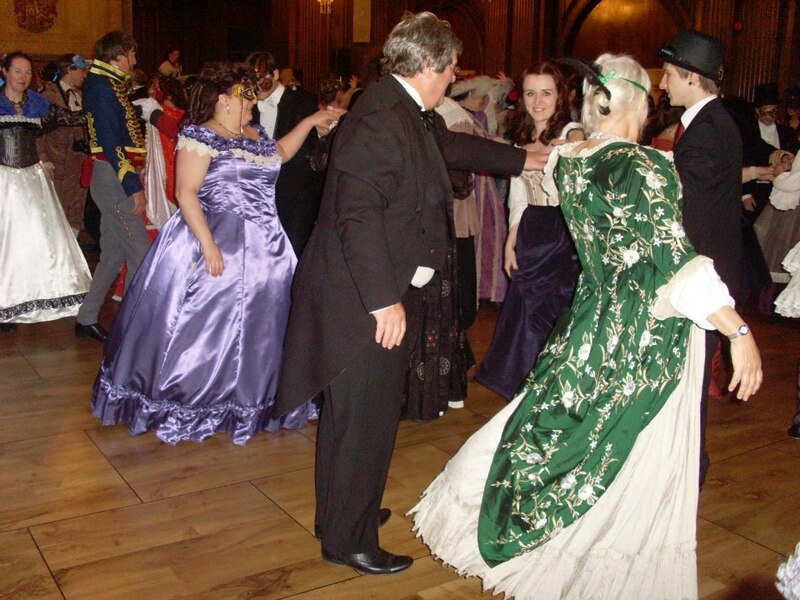 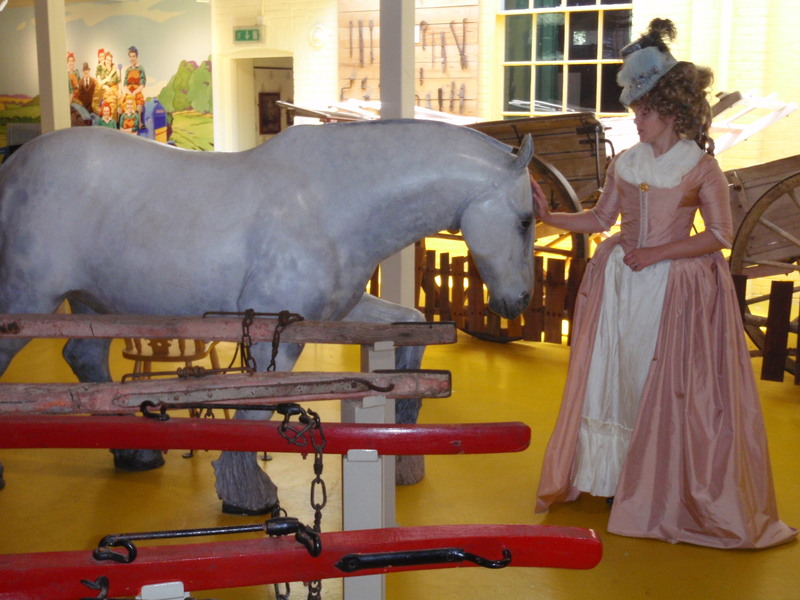 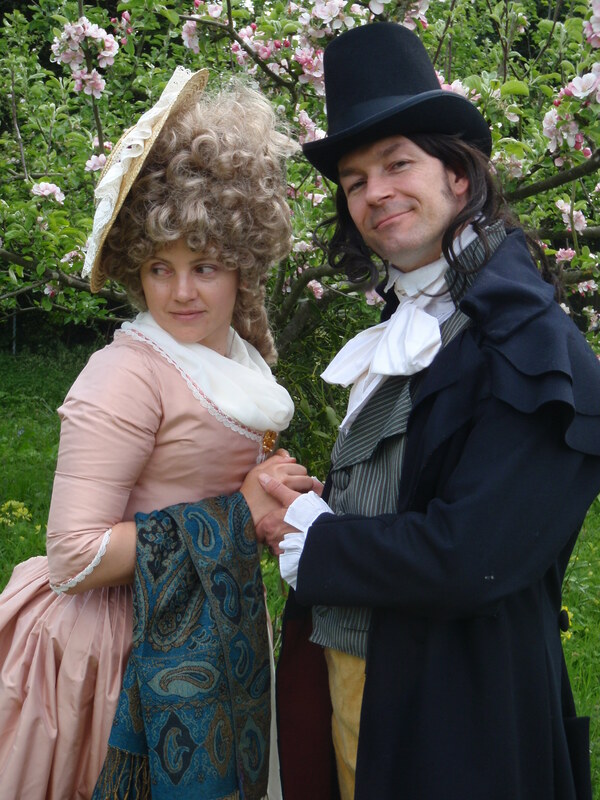 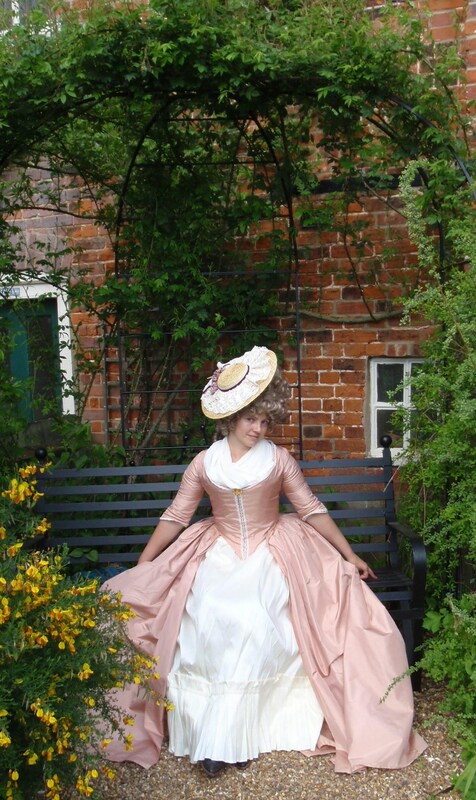 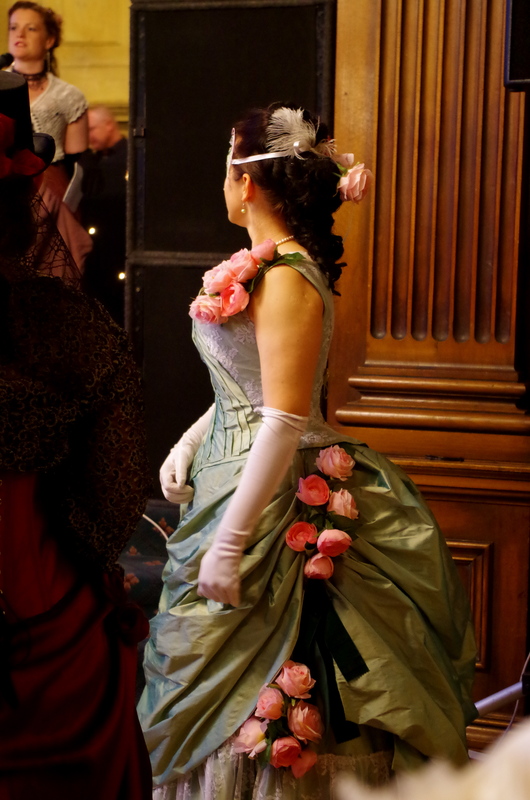 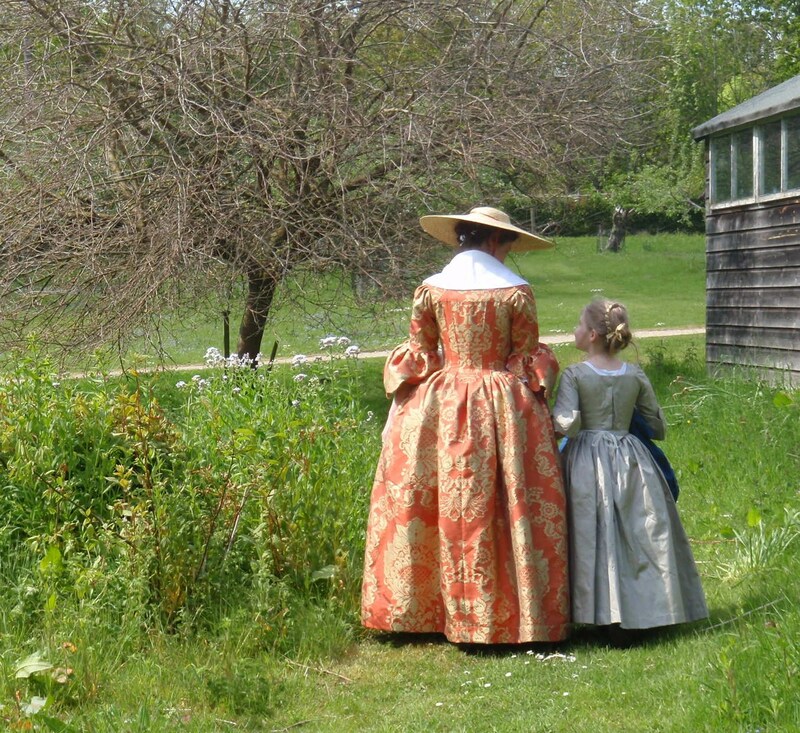 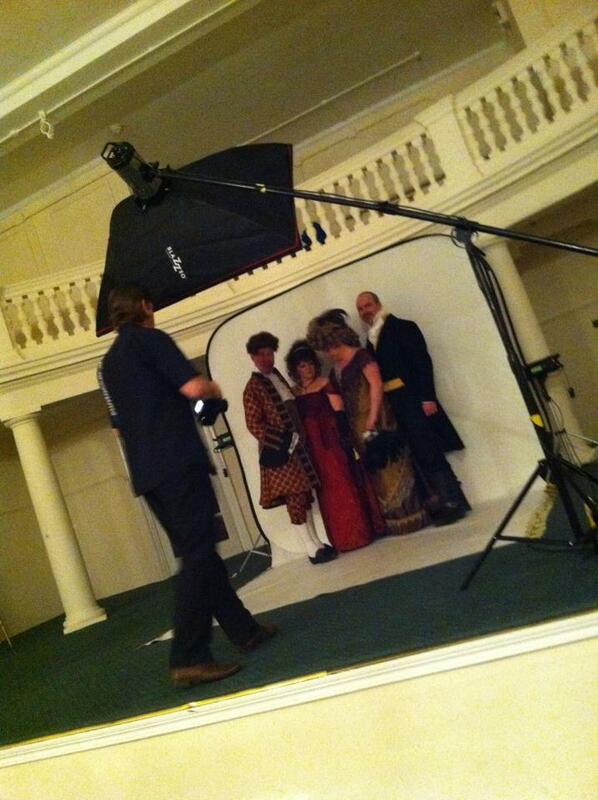 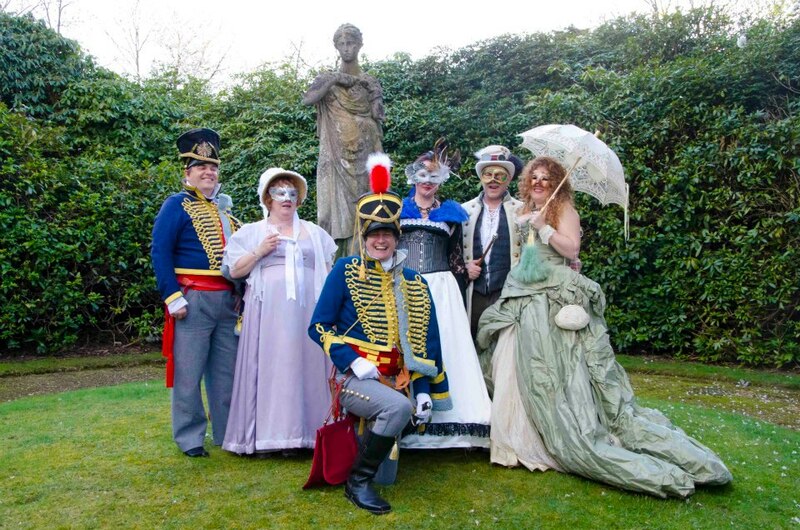 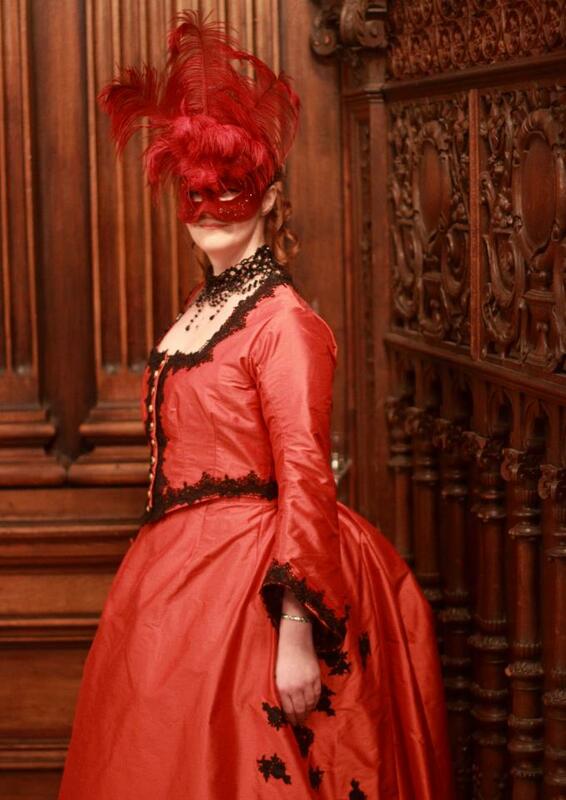 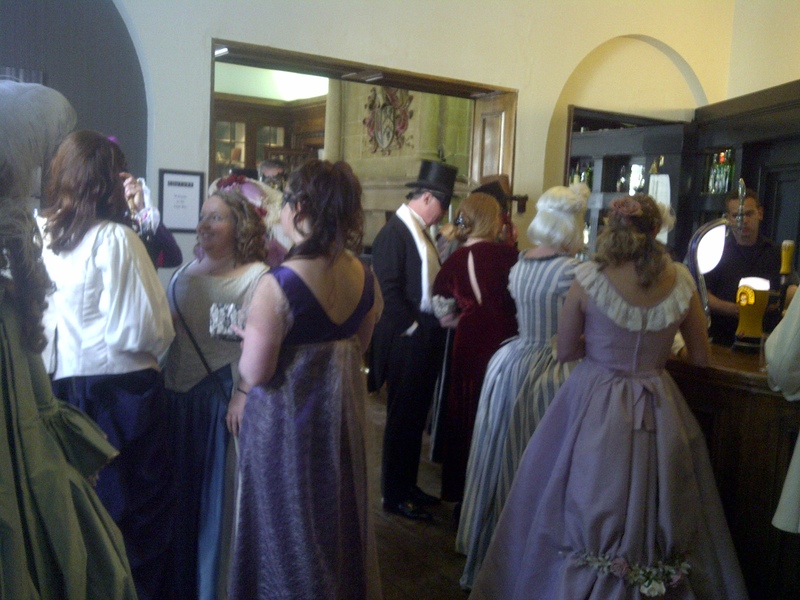 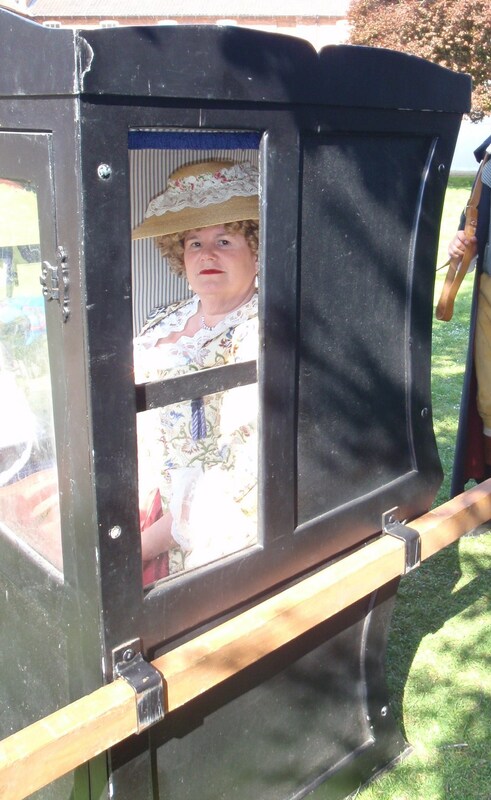 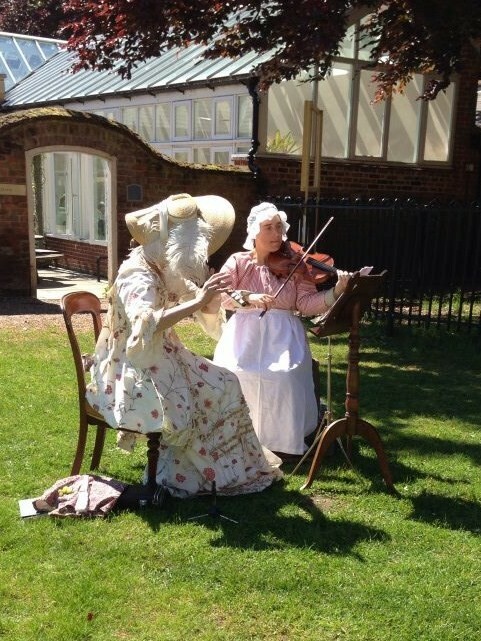 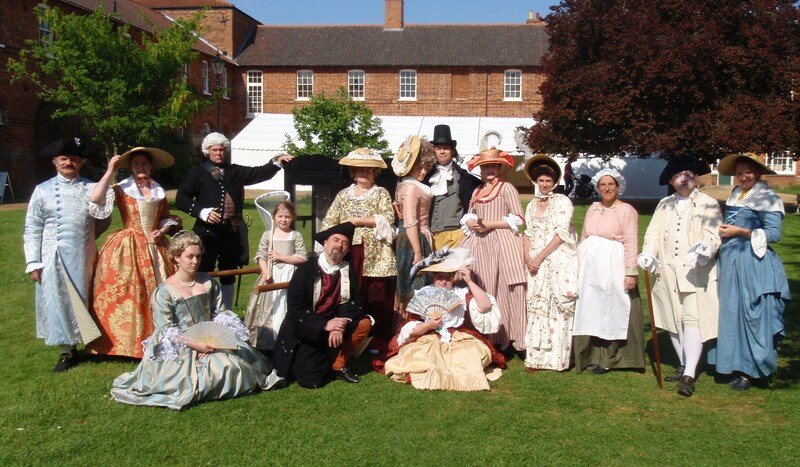 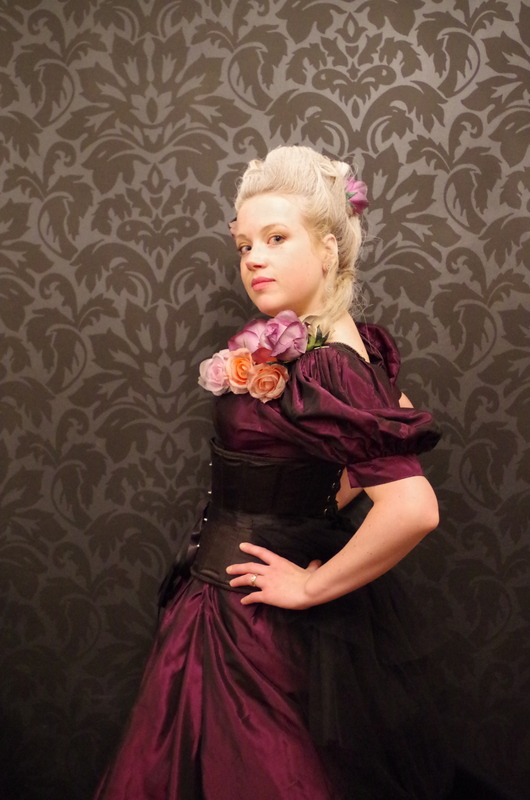 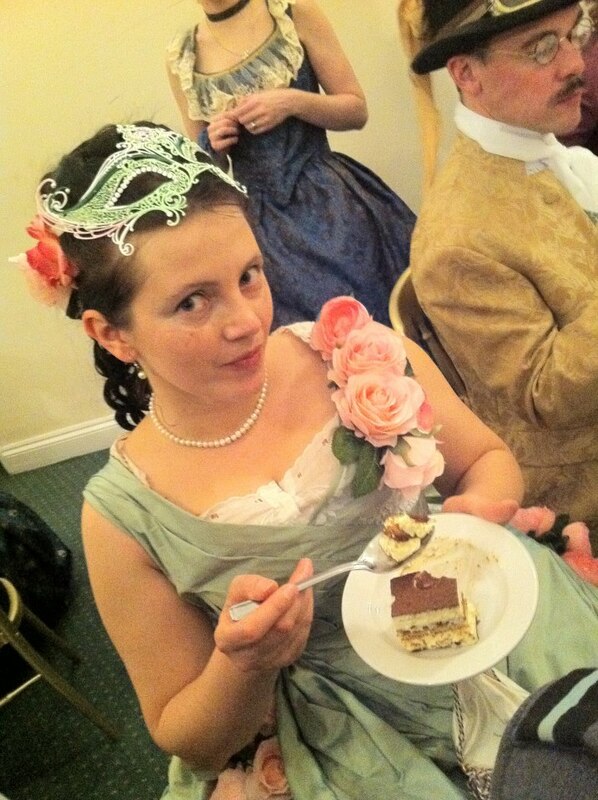 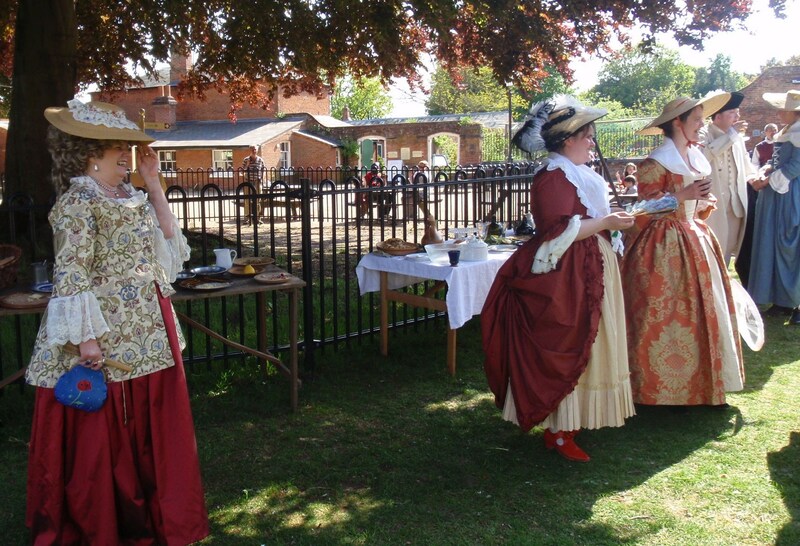 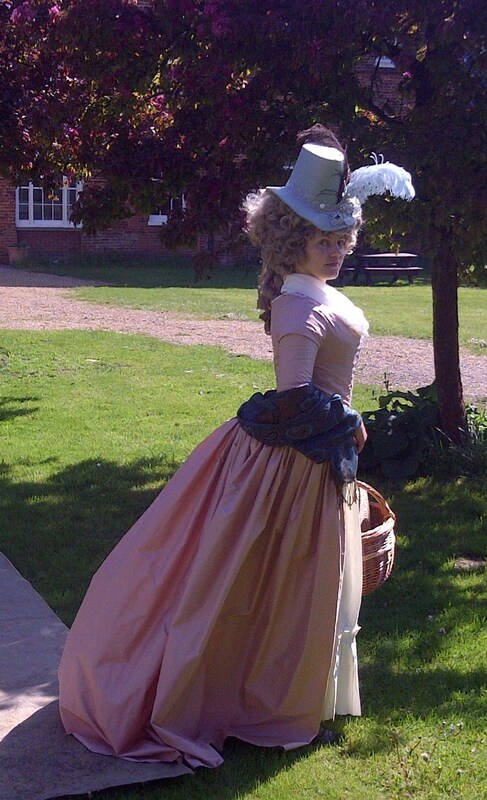 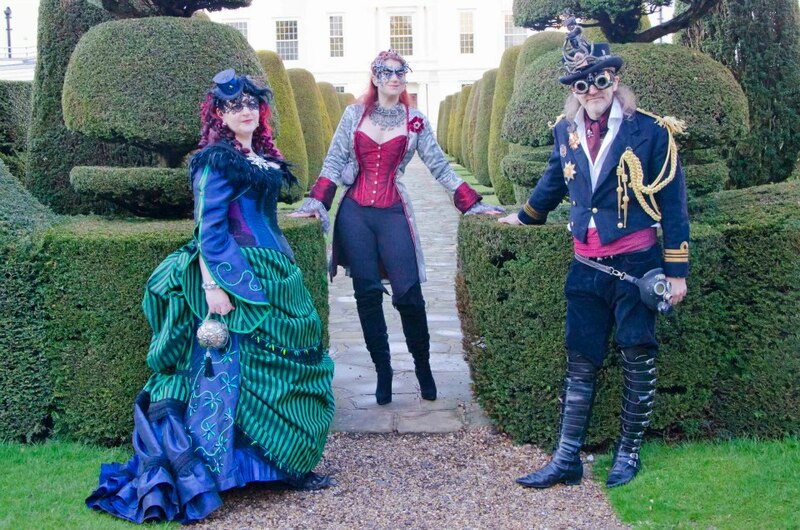 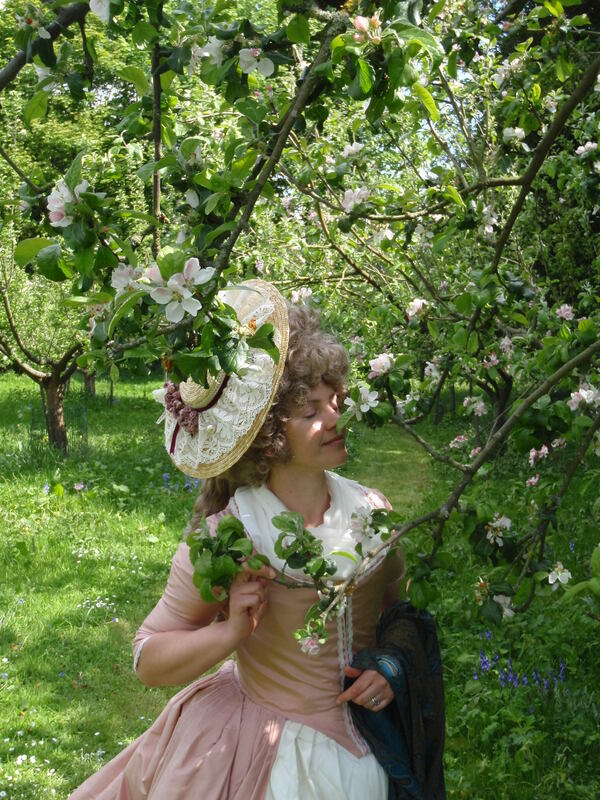 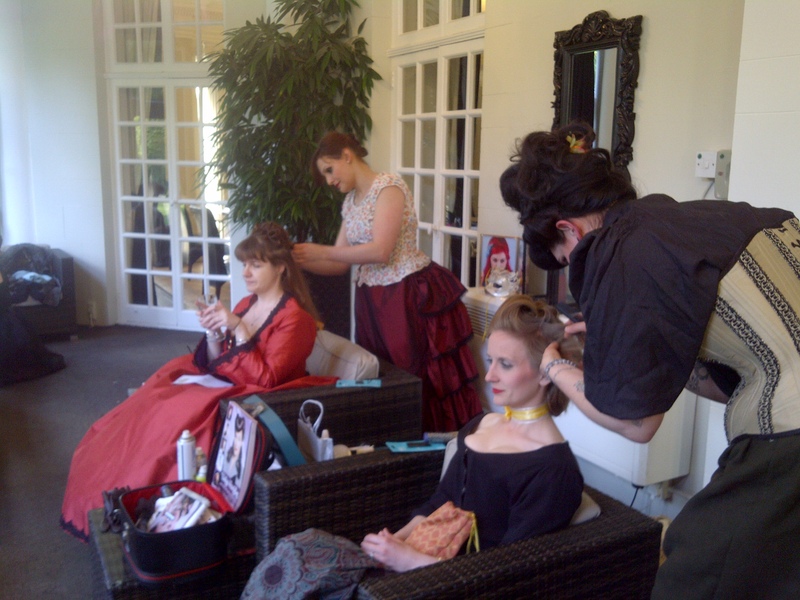 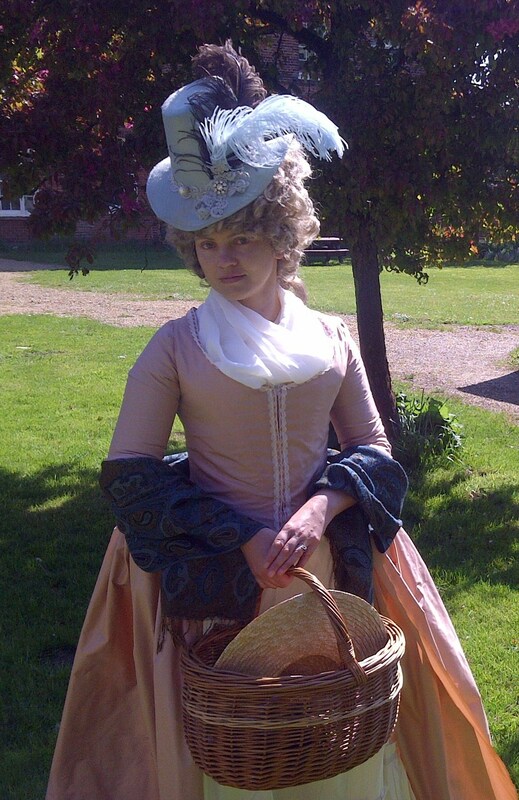 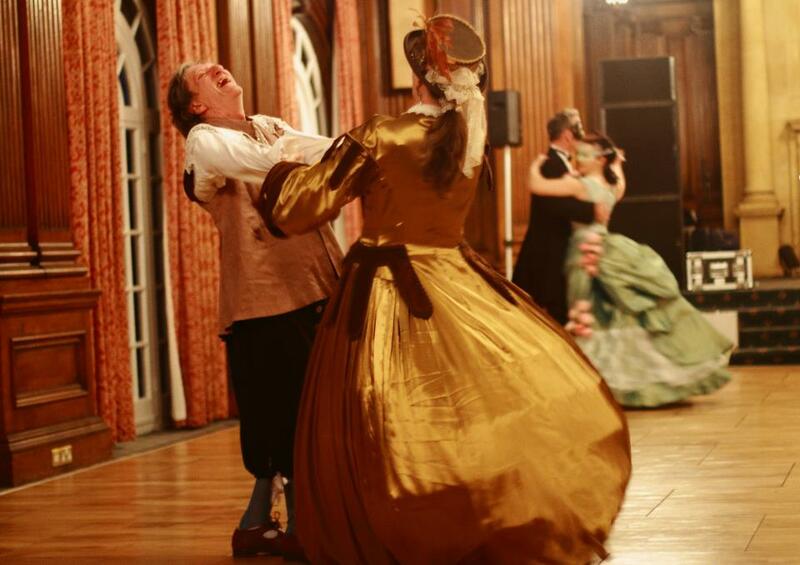 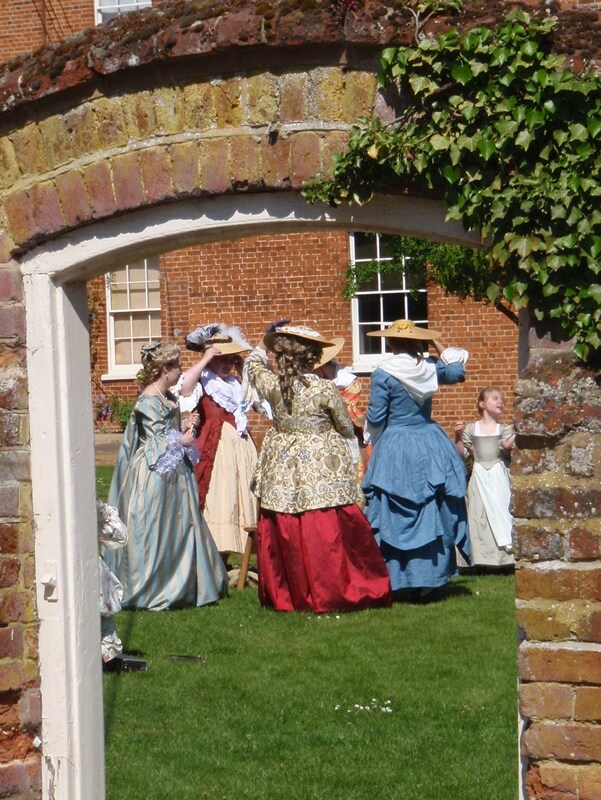 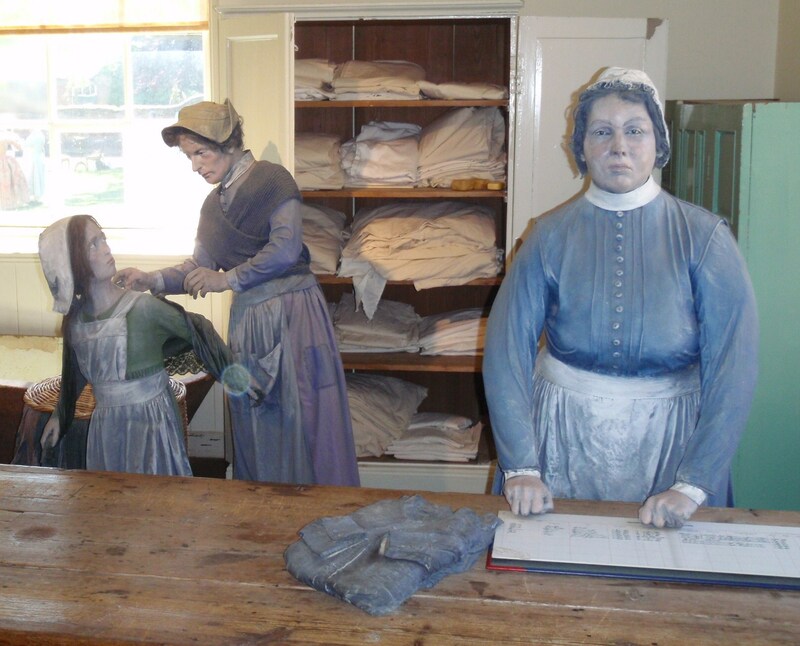 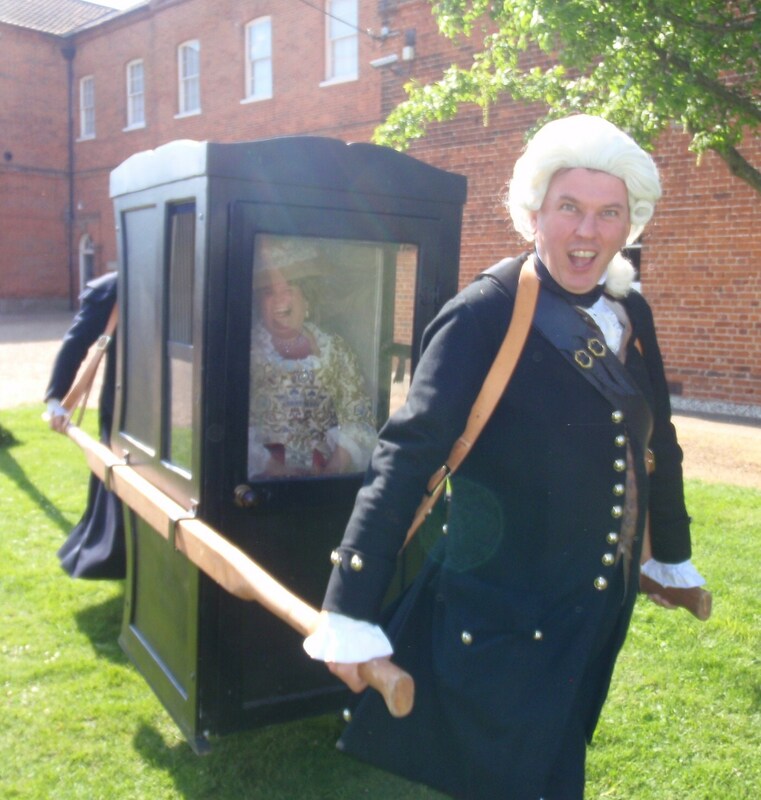 We also included a dress rehearsal before my wedding – just making sure if the Victorian undergarments worked. 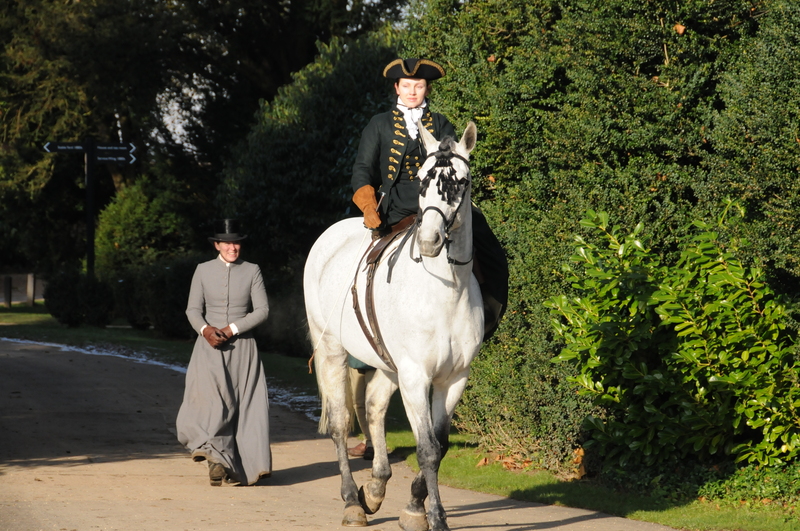 they did – though I must say we naver had so much audience as when doing the dress rehearsal training! 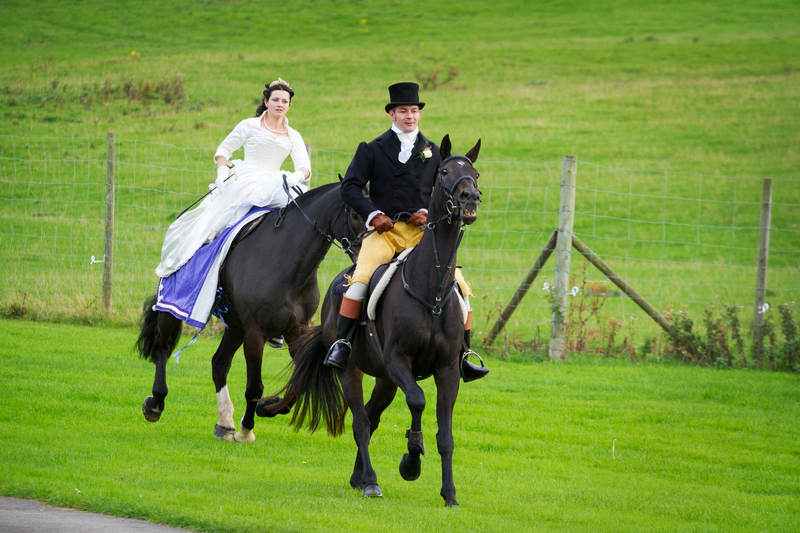 cantering away, with my new husband! 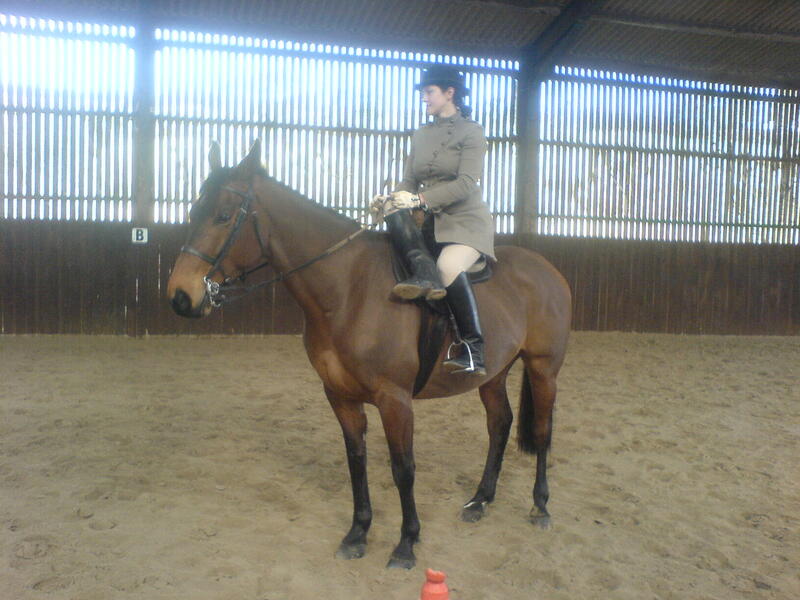 a new habit and a new boy – Jimmy! 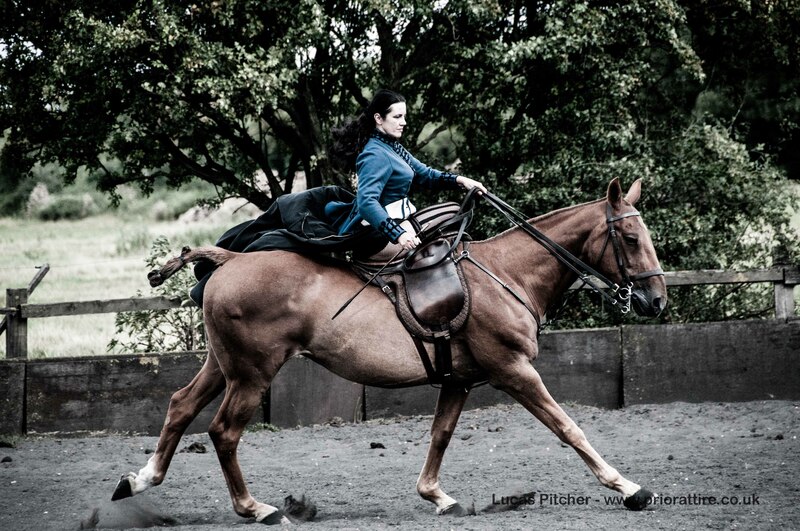 This spring i hope to continue the training so that next season I am able to do some hunting aside – fingers crossed.